Taken by Holloway Studio (St. John's, NL). 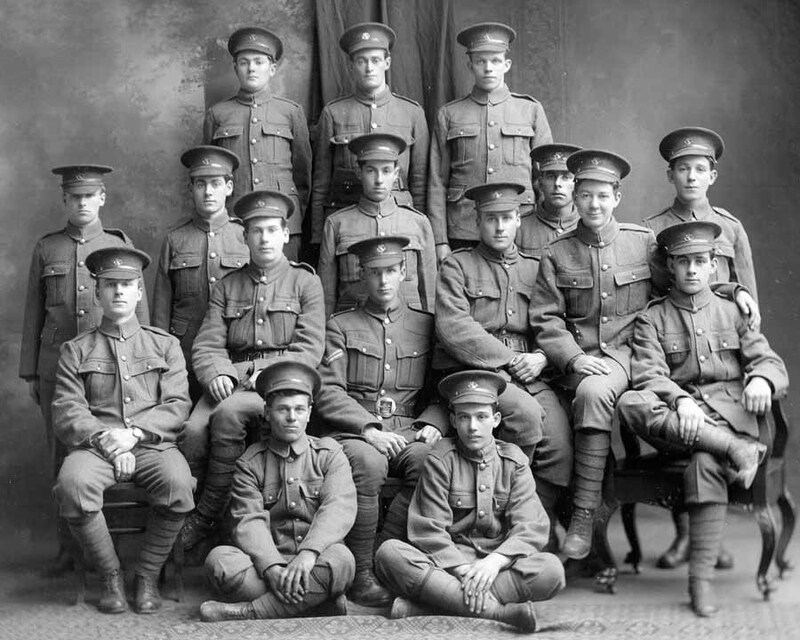 1st Newfoundland Regiment Section Group, Section 2, Platoon 1, 2Lt Cliff Rendell. 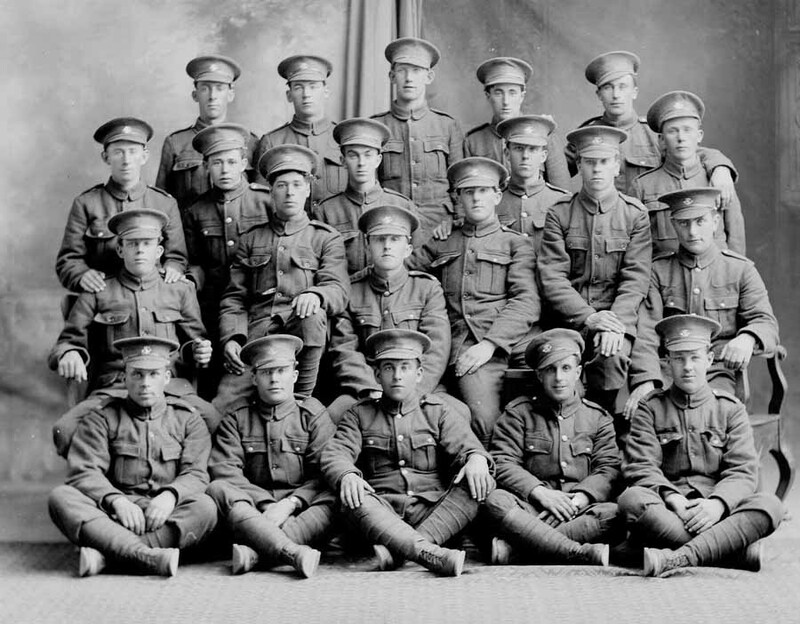 Last soldier at right in the front row has in the past been misidentified as John Shiwak of Rigolet, Labrador. The identity of this soldier remains unknown. 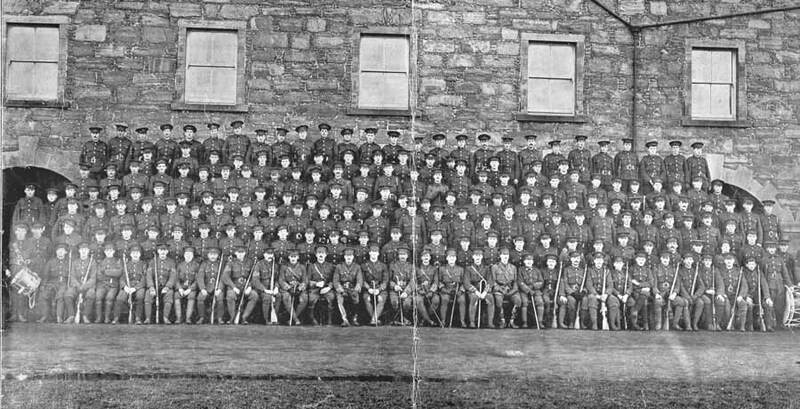 Courtesy of The Rooms Provincial Archives Division (A 11-147), St. John's, NL. 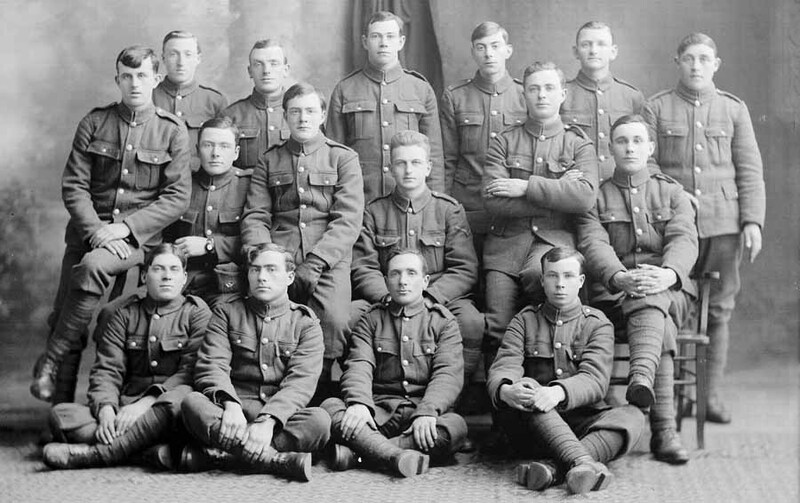 No.1 Platoon, Section 3, n.d. 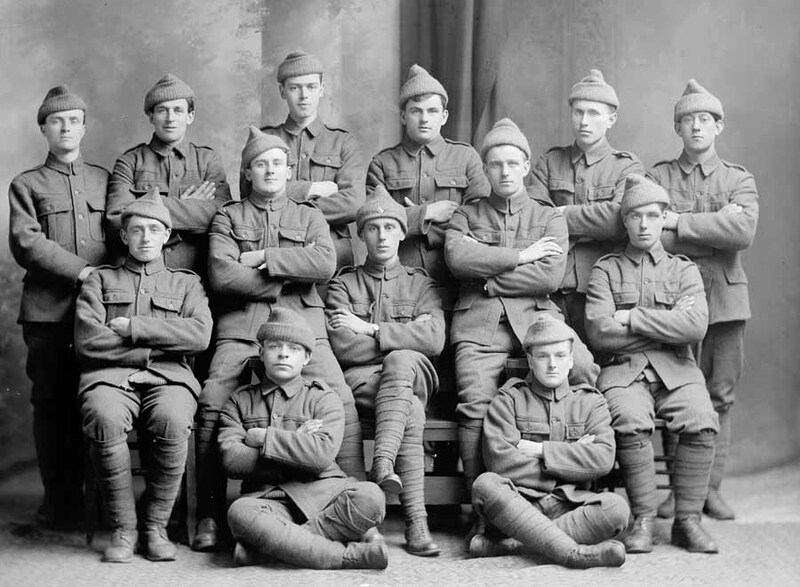 Courtesy of The Rooms Provincial Archives Division (B 3-169), St. John's, NL. 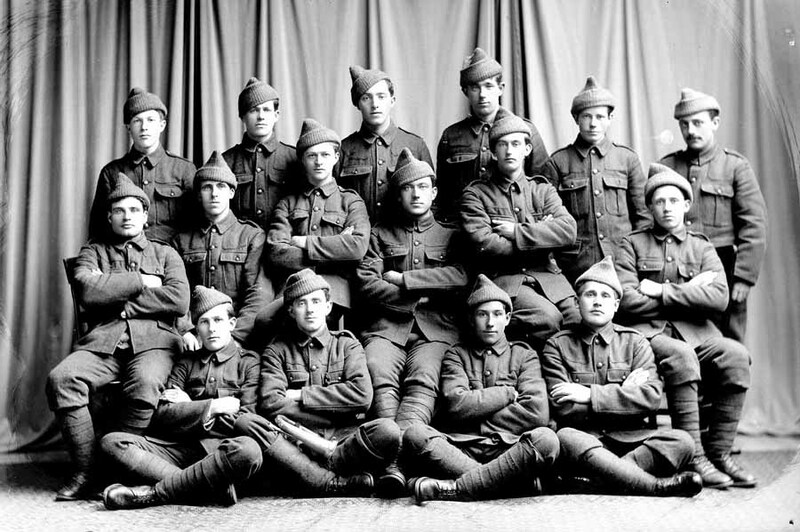 No.2 Platoon, Section 6, n.d. 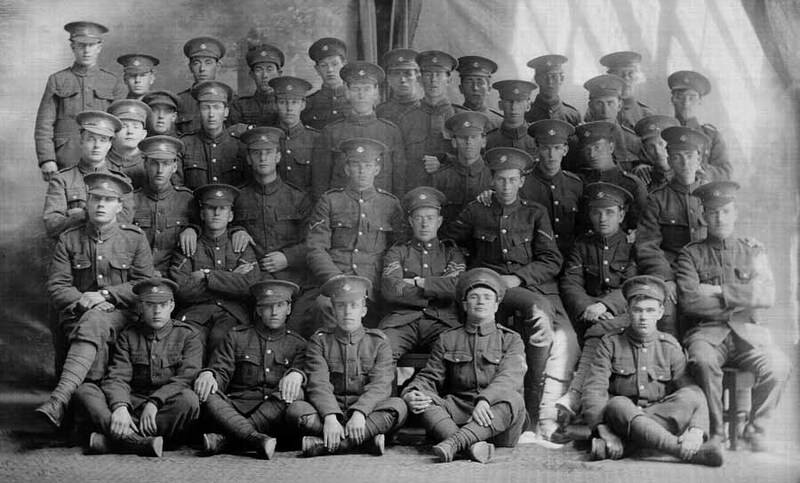 Courtesy of The Rooms Provincial Archives Division (F 25-14), St. John's, NL. 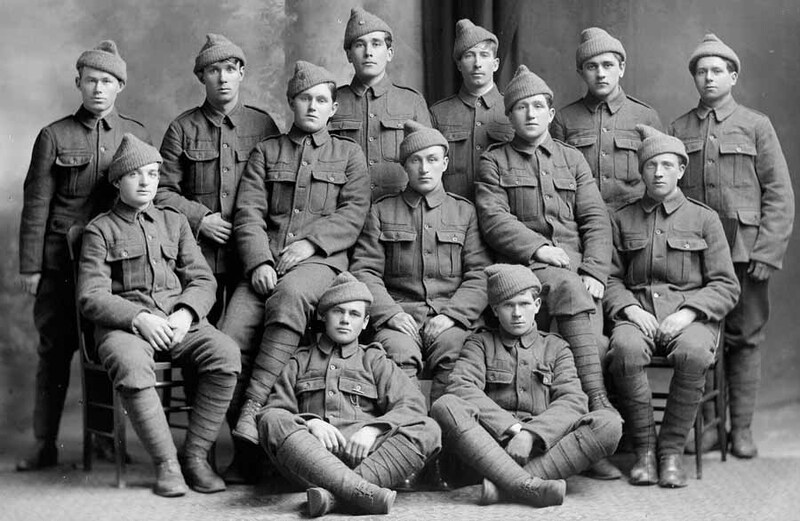 Courtesy of The Rooms Provincial Archives Division (B 3-163), St. John's, NL. 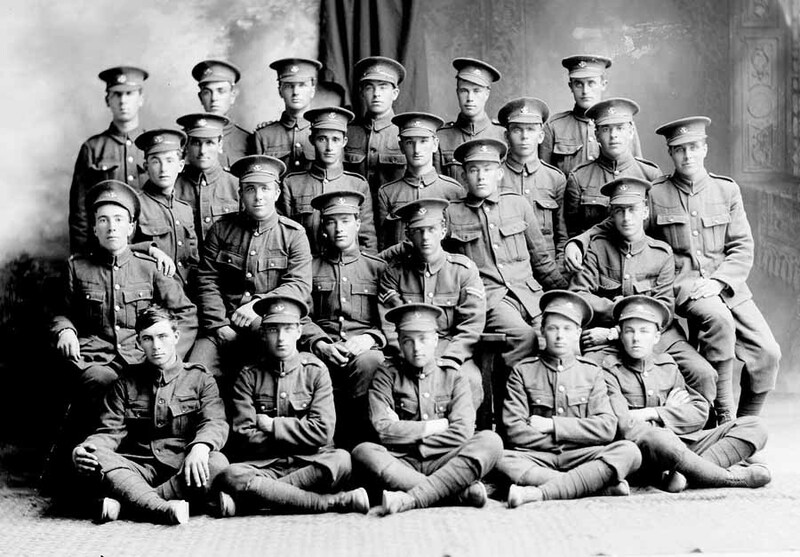 No.4 Platoon, Section 3, n.d. Courtesy of The Rooms Provincial Archives Division (F 40-14), St. John's, NL. 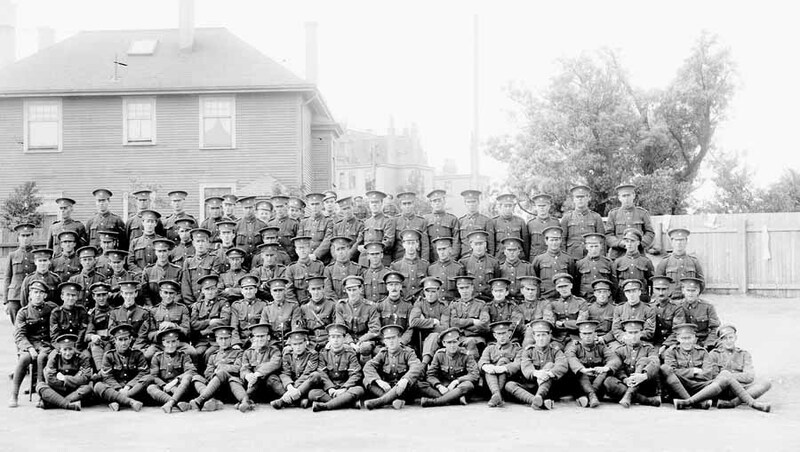 No.4 Platoon, Section 13, n.d. Courtesy of The Rooms Provincial Archives Division (F 37-11), St. John's, NL. Taken by Holloway Studio (St. John's, NL). Studio portrait. 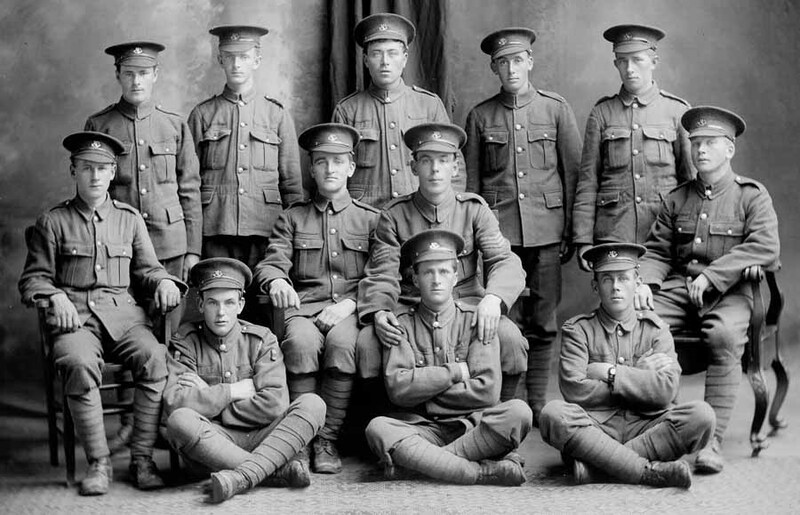 Written on lower right corner: "Corp. Dee" [John Leo Dee, Regt. # O-264, 2403]. Dee is in the centre of the photograph. Credited to Holloway Studio. Dated 1 June 1916. 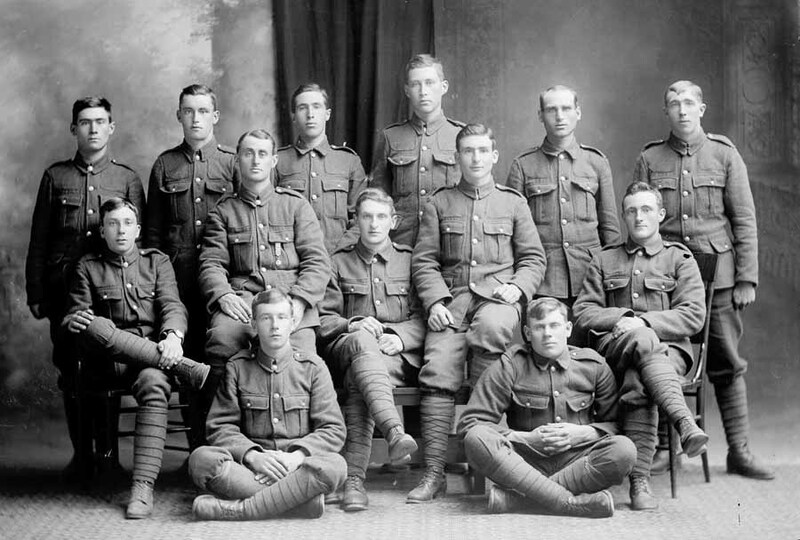 Courtesy of The Rooms Provincial Archives Division (A 11-142), St. John's, NL. 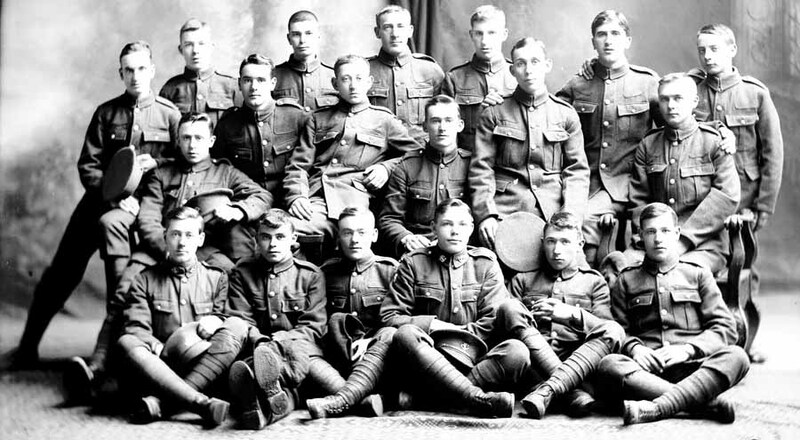 No.4 Platoon, Section 16, n.d. 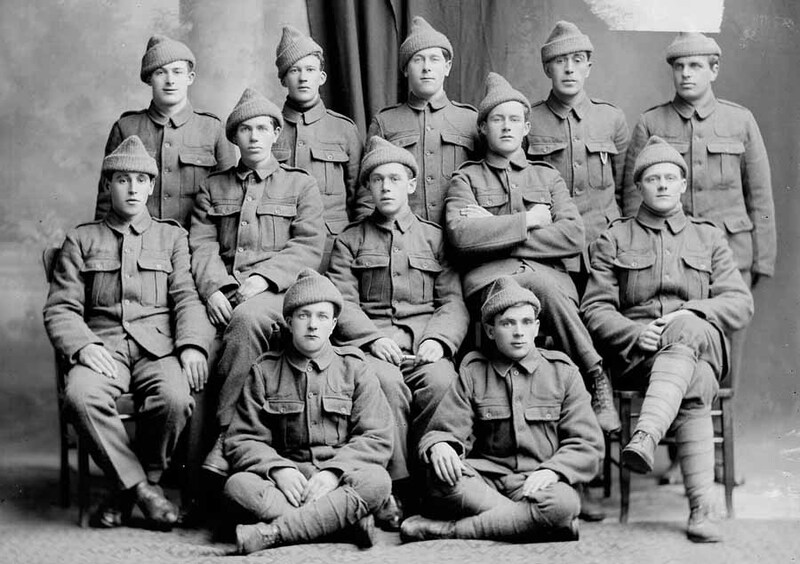 Courtesy of The Rooms Provincial Archives Division (B 5-147), St. John's, NL. 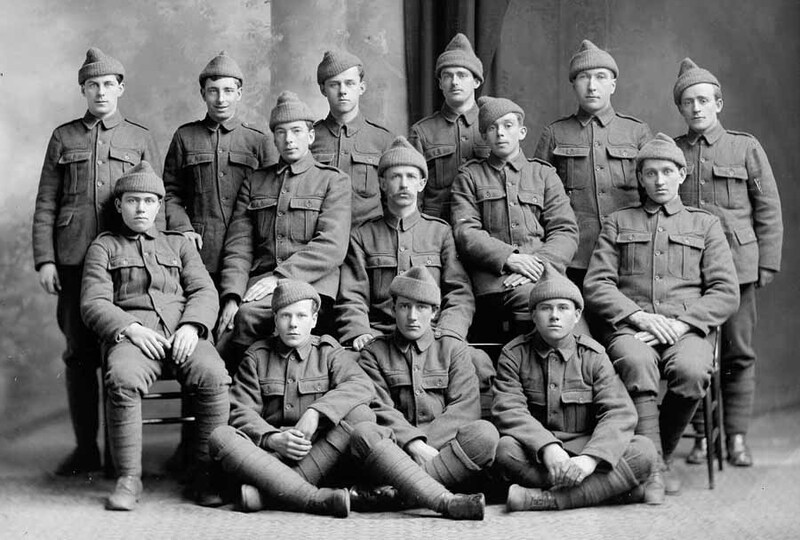 No.5 Platoon, Section 8, n.d. Courtesy of The Rooms Provincial Archives Division (F 40-3), St. John's, NL. 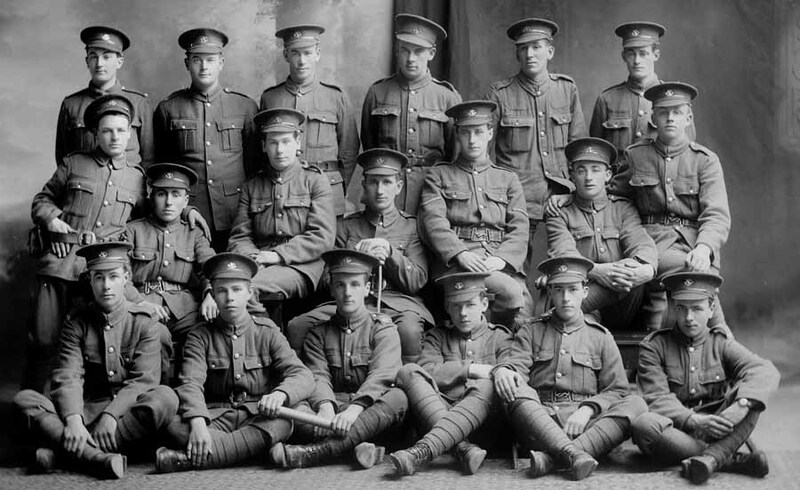 No.6 Platoon, Section 6, n.d. Courtesy of The Rooms Provincial Archives Division (F 40-11), St. John's, NL. Courtesy of The Rooms Provincial Archives Division (F 40-10), St. John's, NL. Courtesy of The Rooms Provincial Archives Division (F 40-12), St. John's, NL. Taken by Holloway Studio (St. John's, NL). 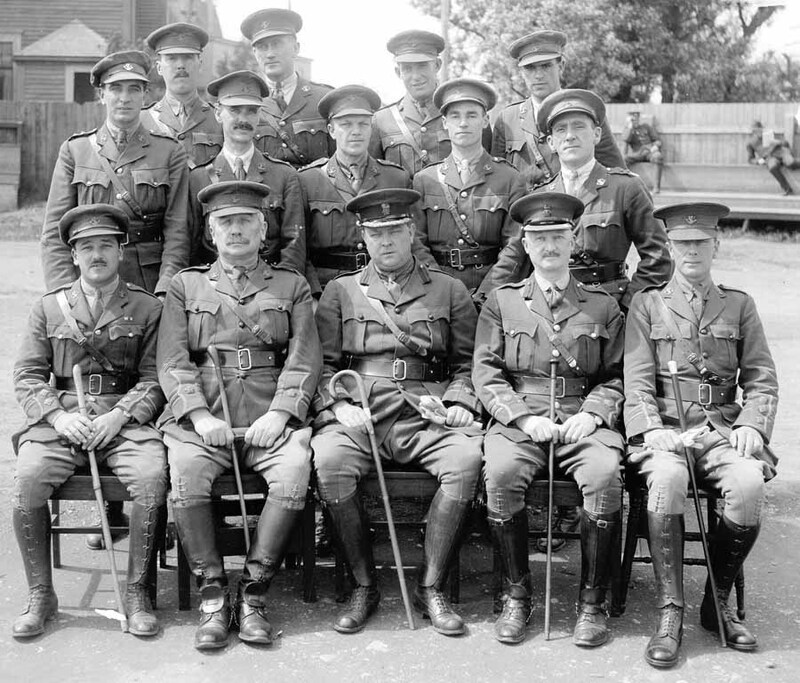 Section commander seated at centre wearing corporal rank. Courtesy of The Rooms Provincial Archives Division (F 40-13), St. John's, NL. Courtesy of The Rooms Provincial Archives Division (F 25-19), St. John's, NL. 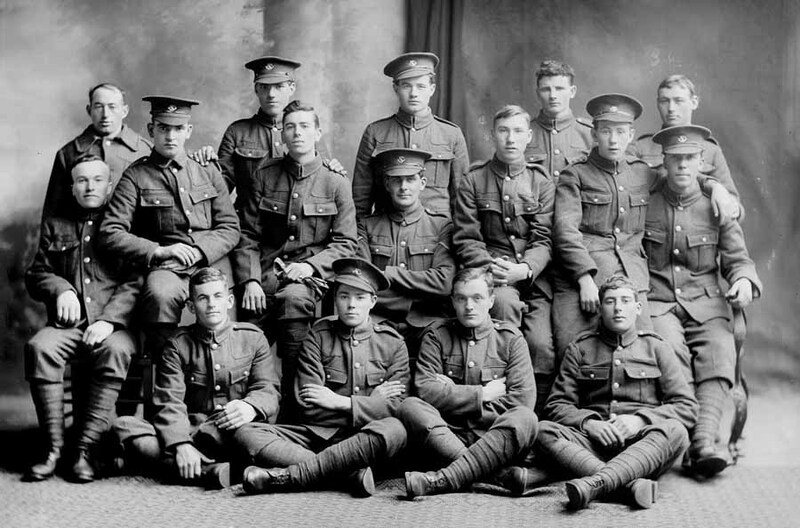 Taken by Robert Palfrey Holloway, Holloway Studio (St. John's, NL). 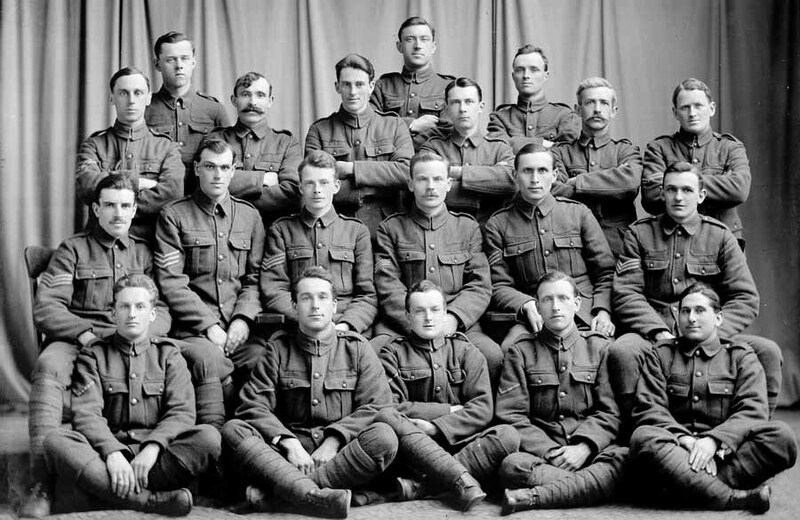 Group portrait of nineteen Regiment volunteers. 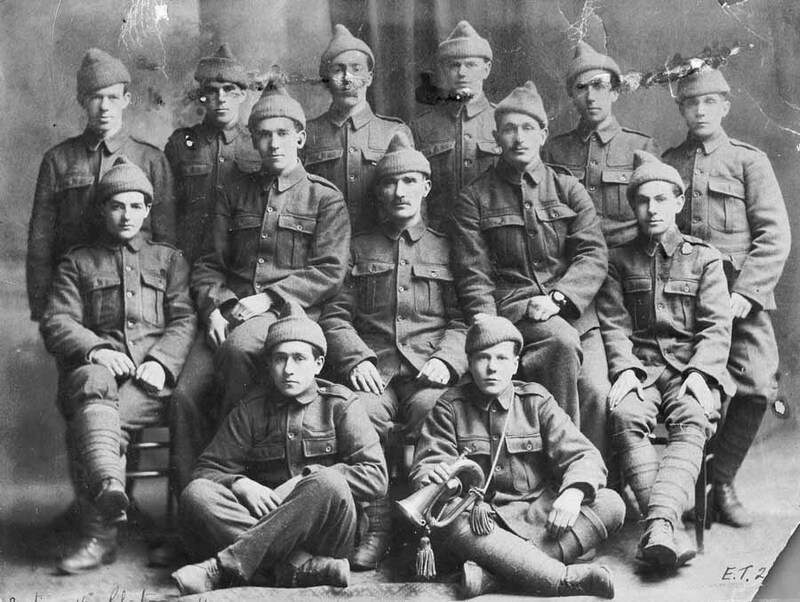 All are wearing balaclava helmets and soldier seated in front has a bugle. 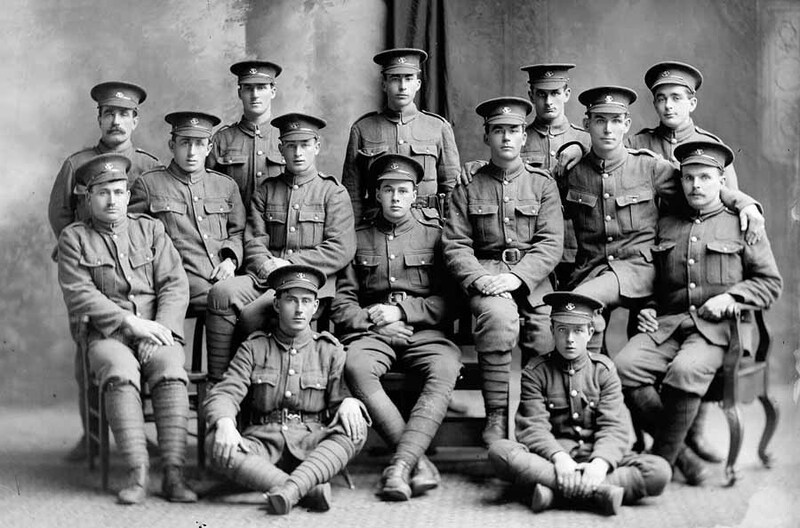 Soldier in the centre is a Lance-Corporal. Courtesy of The Rooms Provincial Archives Division (F 40-9), St. John's, NL. 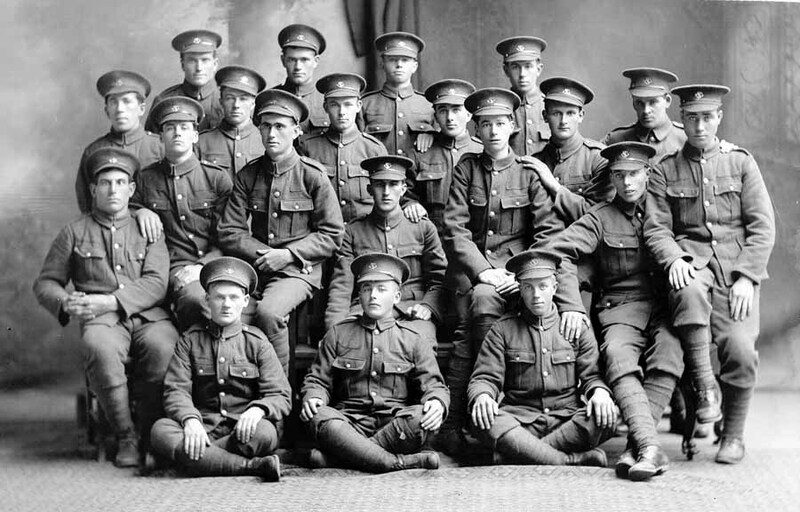 No.6 Platoon, Section 7, n.d. Courtesy of The Rooms Provincial Archives Division (F 37-28), St. John's, NL. 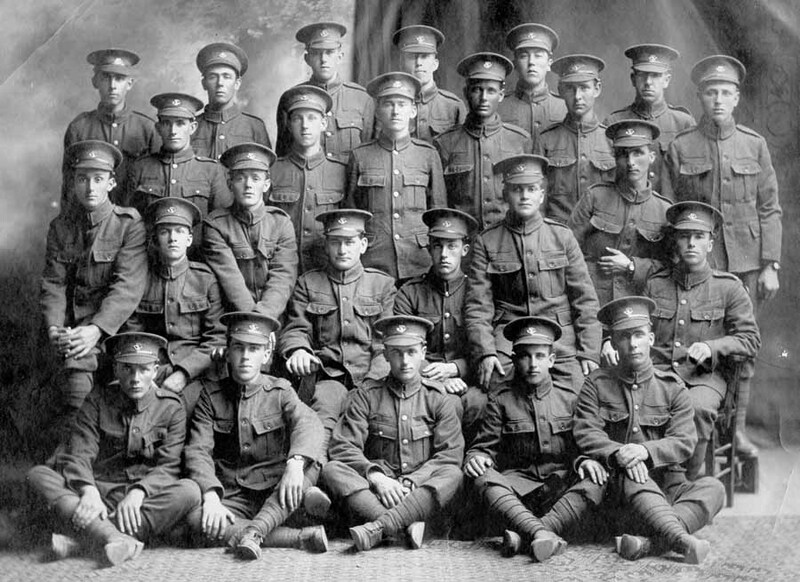 No.6 Platoon, Section 8, n.d. Courtesy of The Rooms Provincial Archives Division (F 40-2), St. John's, NL. 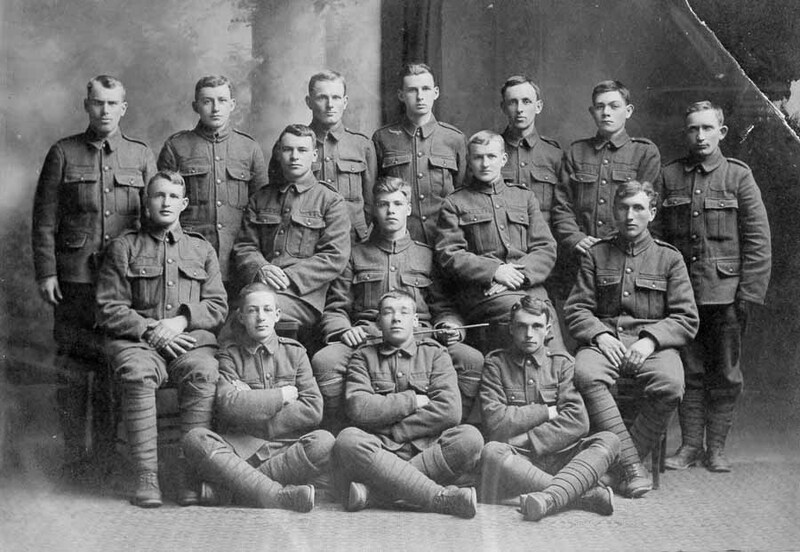 No.7 Platoon, Section 3, n.d. Courtesy of The Rooms Provincial Archives Division (F 48-3), St. John's, NL. 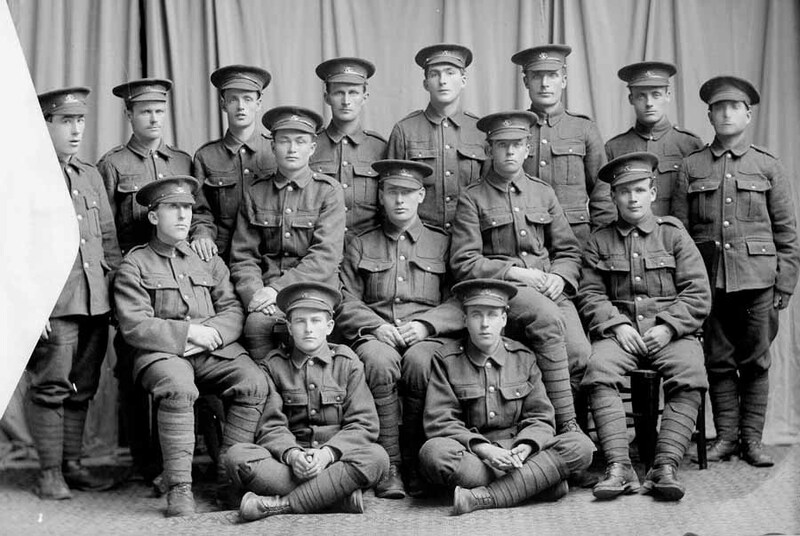 No.7 Platoon, Section 5, n.d. Courtesy of The Rooms Provincial Archives Division (F 48-19), St. John's, NL. 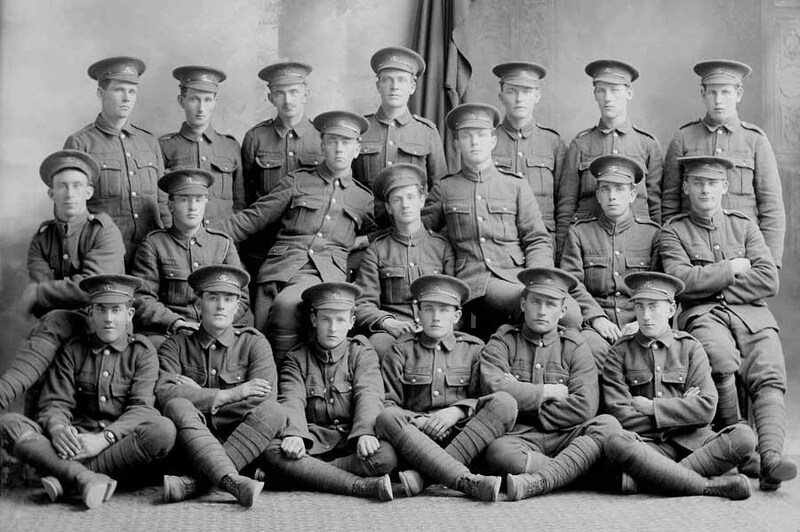 No.9 Platoon, Section 1, n.d. Courtesy of The Rooms Provincial Archives Division (F 48-17), St. John's, NL. Group Signals, 3rd Company, n.d. Courtesy of The Rooms Provincial Archives Division (F 46-18), St. John's, NL. Taken at Holloway Studio (St. John's, NL). Identified on reverse: [Albert W.?] 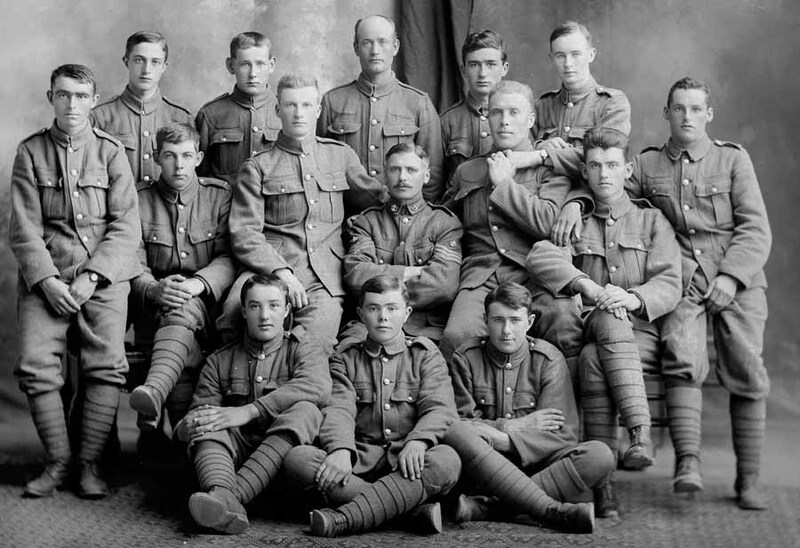 Banfield (Regt. # 1687); J. [Joshua] George (Regt. # 2015); E. [Ernest] B. Cheeseman (Regt. # 1927); E. Mar's[?] [possibly Edward Maher, Regt. # 1105]; A. [Ambrose] Guy (Regt. # 2005); T. Harvey; C. [Clarence] Foley (Regt. 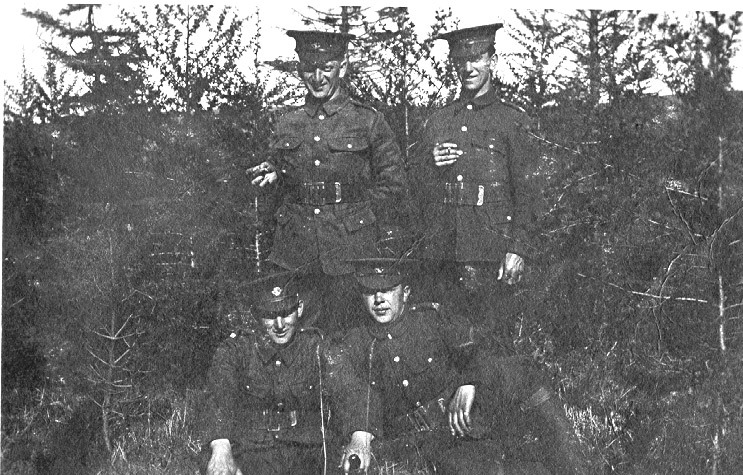 # 2007); J. Penney; L. Brown; H. [Arthur H.] Lawrence (Regt. 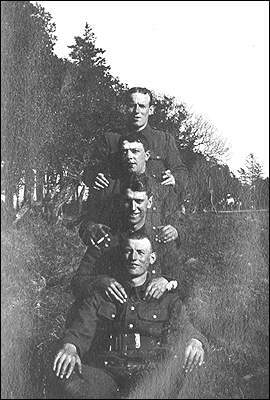 # 2002); C. A. Reid; N. Sheppard; F. Reid; Corp. E. [Eric], Ellis (Regt. 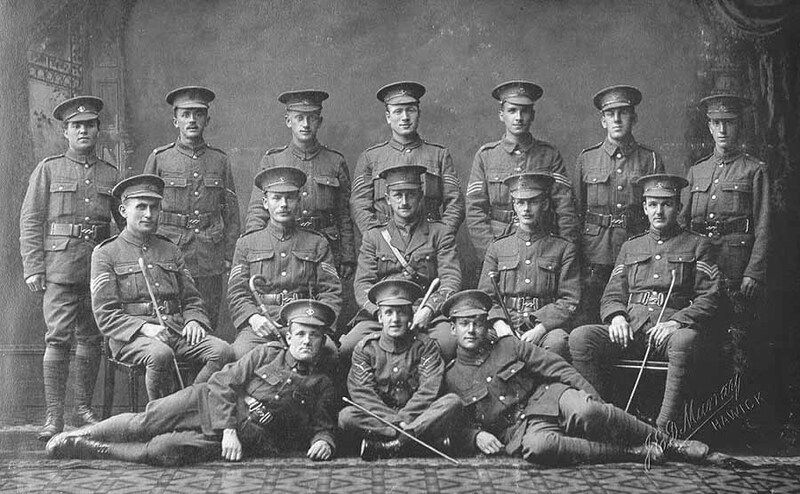 # O-127, 1895); Instructor Hussey; L. [Lemuel] Morey (Regt. # 1967); E. [Ernest H.] Walters (Regt. # 2017); B. [Bella] Abbott (Regt. # 2020); N. Hussey; J. [John] Field (Regt. # 2003); A. Batten (Regt. # 2045); A. [Alfred] Reid (Regt. # 761). Note on reverse: Sec. Group H Co. 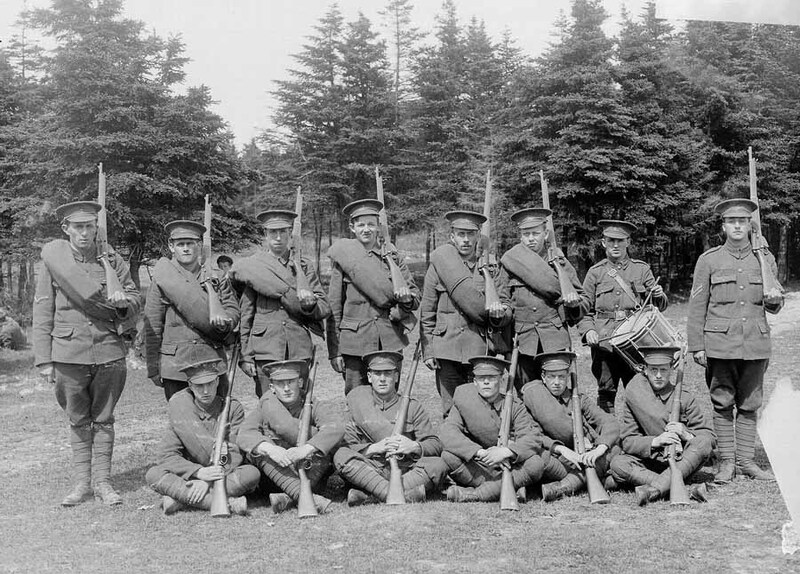 Courtesy of The Rooms Provincial Archives Division (NA 3847), St. John's, NL. 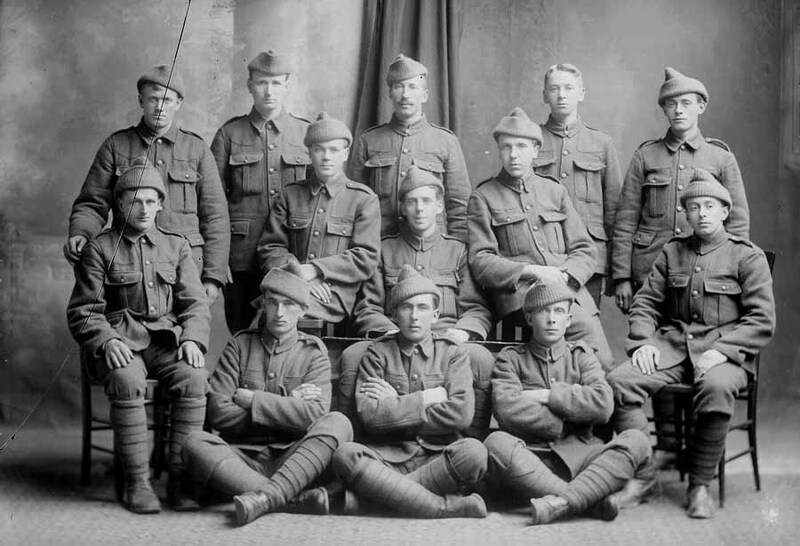 Taken on 27 July 1917. Studio portrait. Identified: Taylor Parsons (Regt. 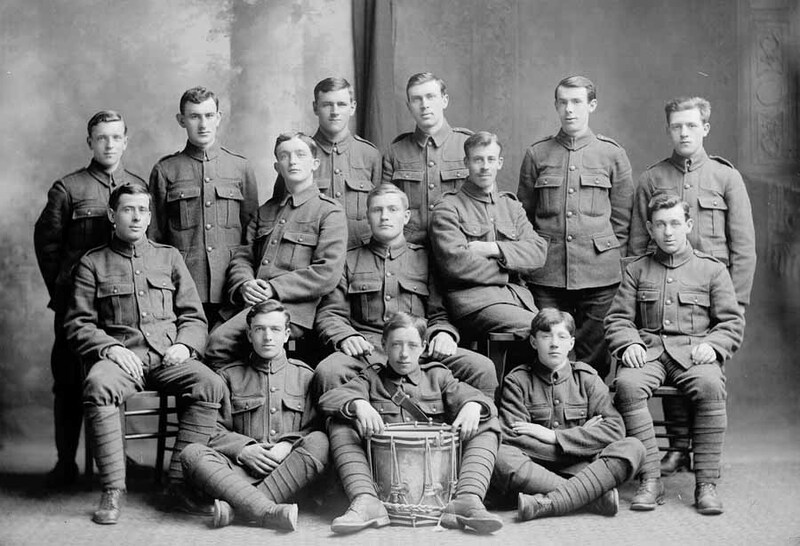 # 3916); Samuel Hollett (Regt. 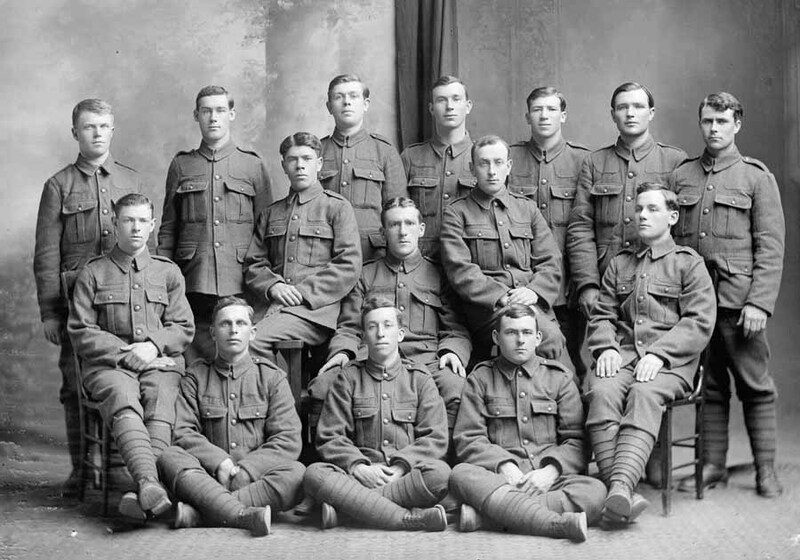 # 3877); Joseph Allen Clarke (Regt. # 3857); Malcolm J. Bishop (Regt. # 3901); John Manuel (Regt. # 3902); James C. Abbott (Regt. # 8414); George Langer (Regt. 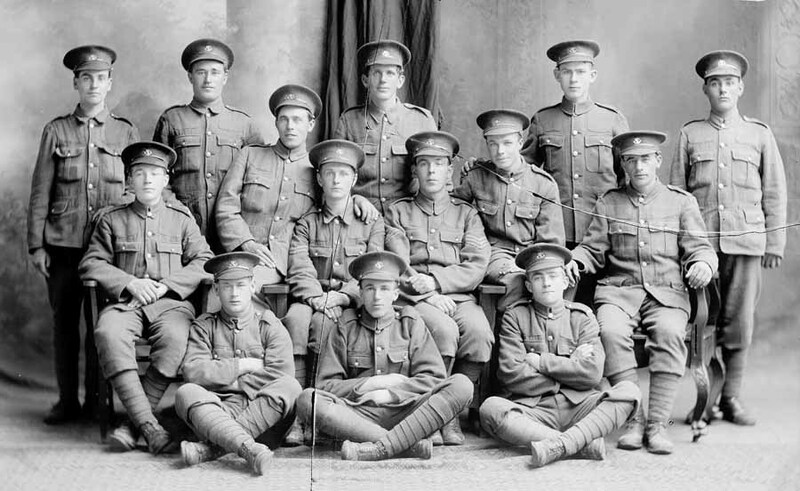 # 3805); Cecil Roberts (Regt. 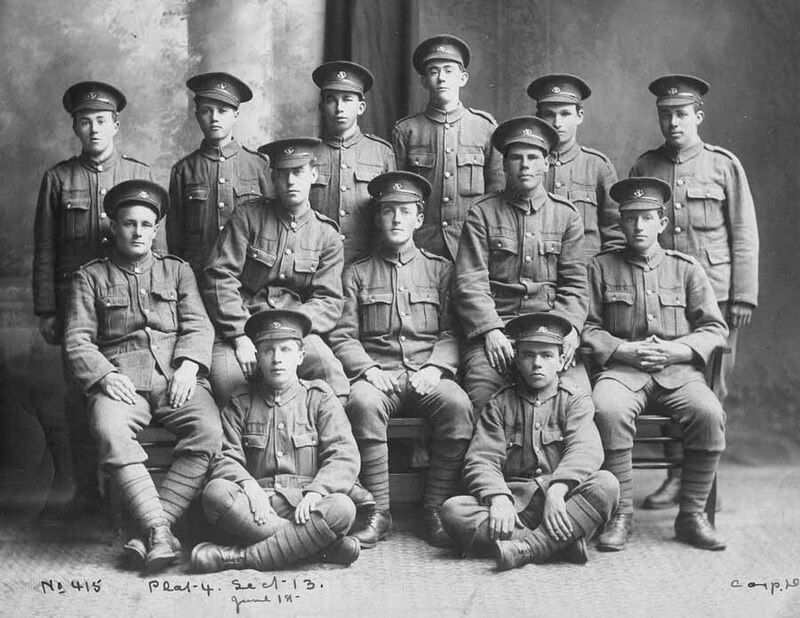 # 3908); Levi Hussey (Regt.# O-284 - 3913); William Parsons (Regt. # 3917); Augustus J. Walsh (Regt. # 3914); Robert Hann (Regt. # 3915); James Delaney (Regt. 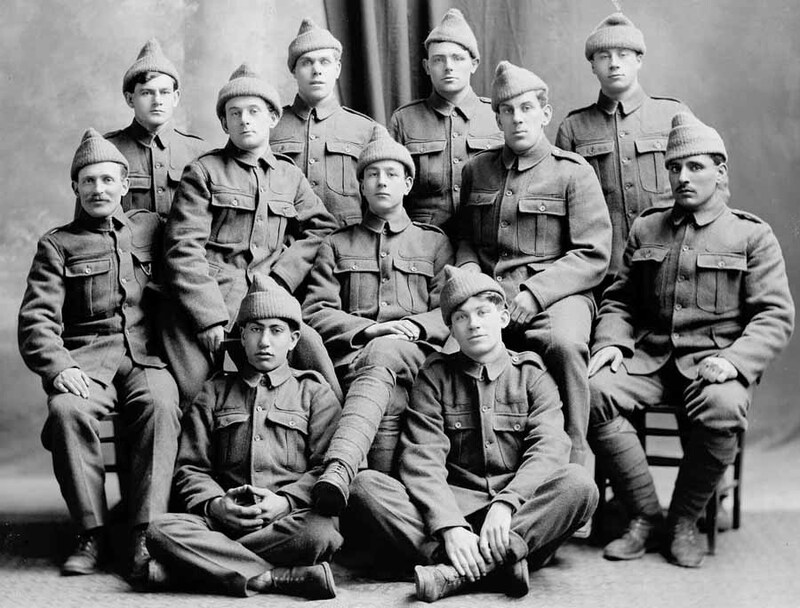 # 3878); Ephrain Stickland (Regt. 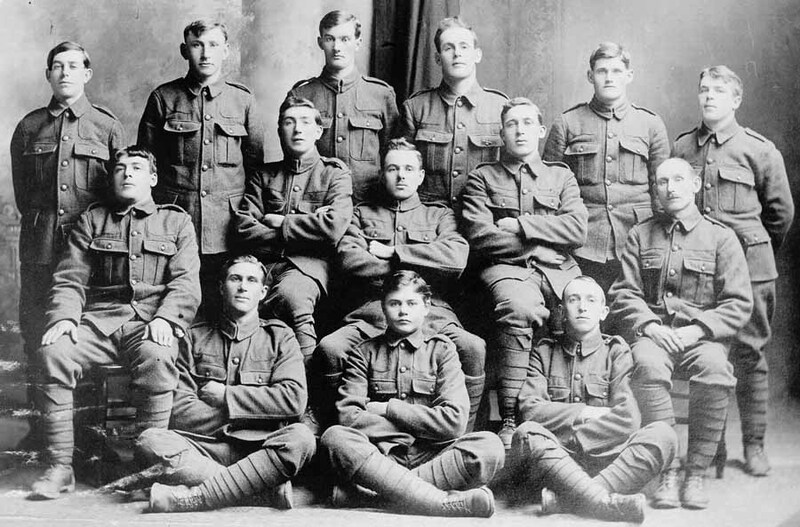 # 3886); Walter Combden (Regt. # 3909); Michael Marry (Regt. # 3903); Harold Yates (Regt. # 3910); Chesley Reid (Regt. # 3912); T. Power (Regt. # 3850); E. Brown; Robert Peel (Regt. # 3888). 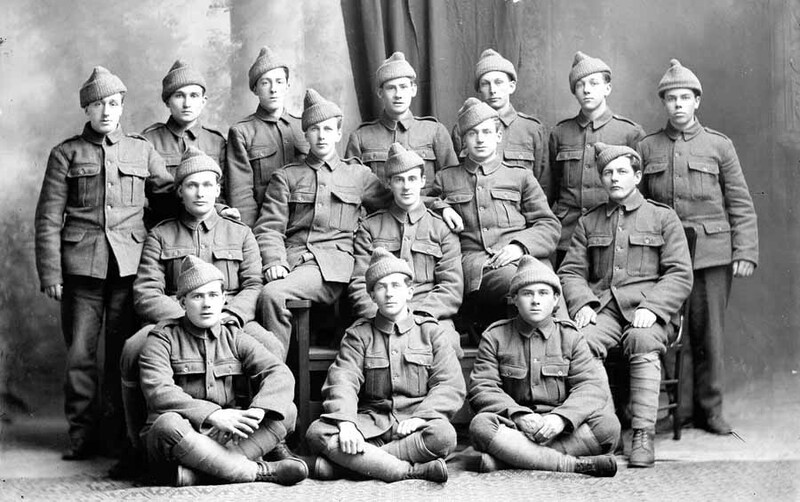 E. Brown is possibly Edward Brown (Regt. # 3804) or Everett Brown (Regt. # 3829). 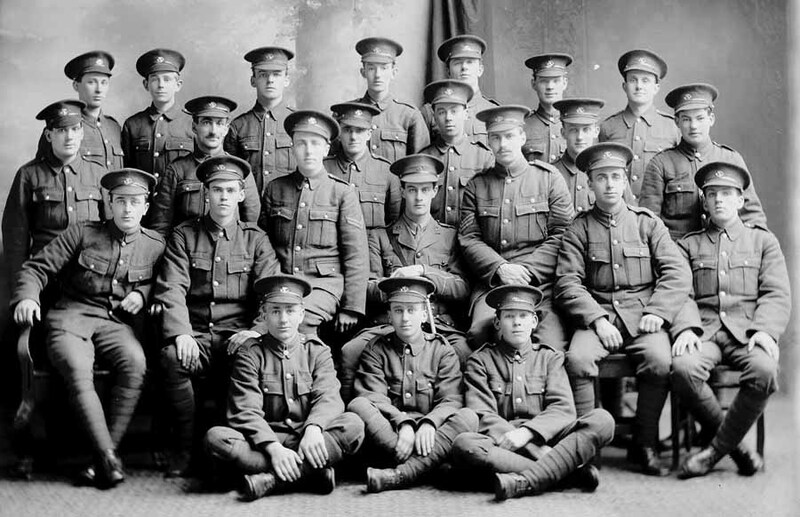 Courtesy of The Rooms Provincial Archives Division (B 3-168), St. John's, NL. Courtesy of The Rooms Provincial Archives Division (F 21-10), St. John's, NL. Courtesy of The Rooms Provincial Archives Division (F 25-10), St. John's, NL. 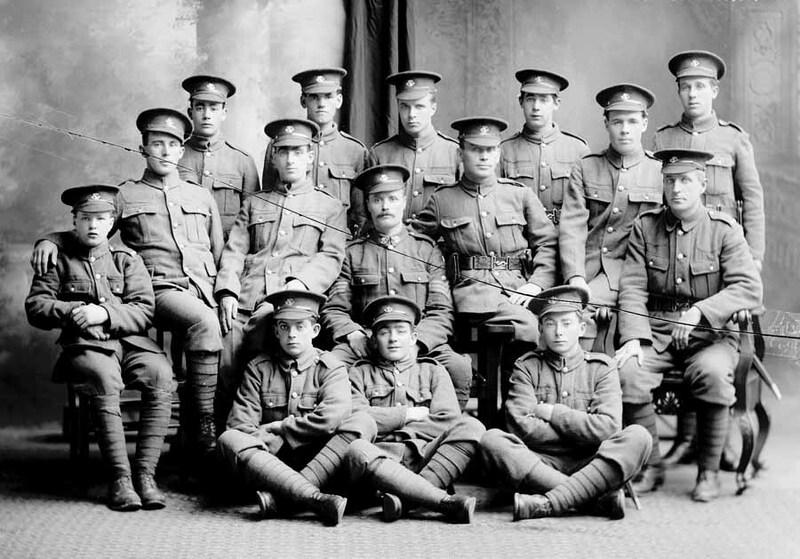 Eleven Royal Newfoundland Regiment volunteers. Courtesy of The Rooms Provincial Archives Division (F 25-27), St. John's, NL. Courtesy of The Rooms Provincial Archives Division (F 25-3), St. John's, NL. Courtesy of The Rooms Provincial Archives Division (F 25-4), St. John's, NL. Courtesy of The Rooms Provincial Archives Division (F 25-5), St. John's, NL. Courtesy of The Rooms Provincial Archives Division (F 25-6), St. John's, NL. Courtesy of The Rooms Provincial Archives Division (F 28-11), St. John's, NL. Courtesy of The Rooms Provincial Archives Division (F 30-24), St. John's, NL. Courtesy of The Rooms Provincial Archives Division (F 30-25), St. John's, NL. 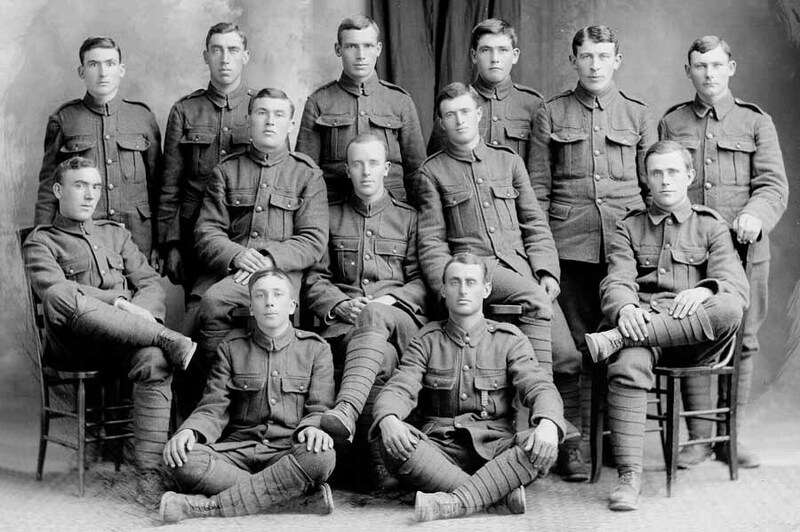 Identified: Wesley Halfyard, second from left, back row. Halfyard survived the war and lived into his 90s. 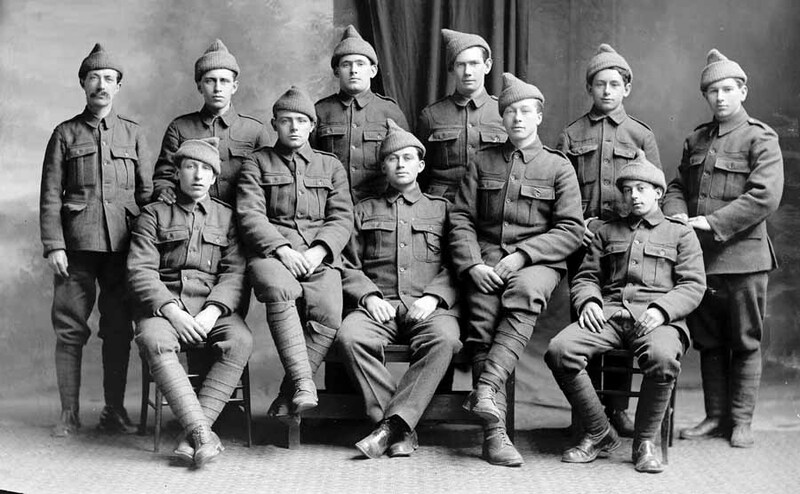 Image courtesy of The Rooms Provincial Archives Division (F 34-21), St. John's, NL. Information on Wesley Halfyard courtesy of his grandson. Courtesy of The Rooms Provincial Archives Division (F 37-10), St. John's, NL. Courtesy of The Rooms Provincial Archives Division (F 37-12), St. John's, NL. Courtesy of The Rooms Provincial Archives Division (F 37-13), St. John's, NL. 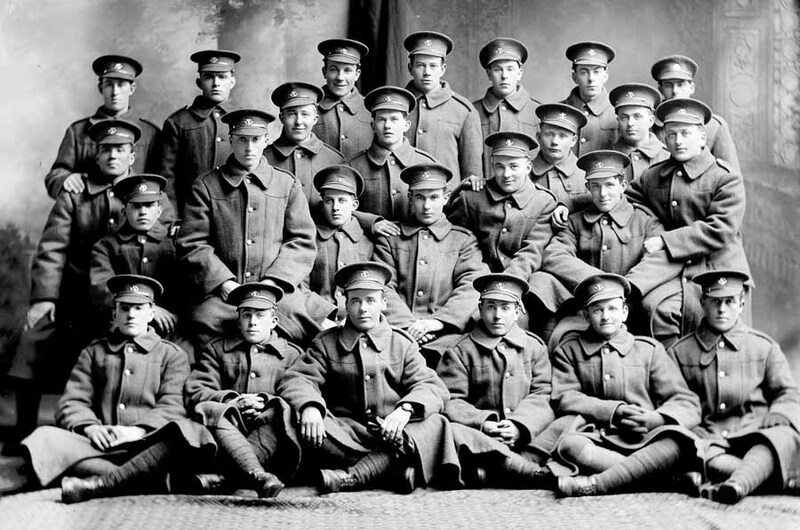 Courtesy of The Rooms Provincial Archives Division (F 37-14), St. John's, NL. Courtesy of The Rooms Provincial Archives Division (F 37-16), St. John's, NL. Courtesy of The Rooms Provincial Archives Division (F 37-18), St. John's, NL. Courtesy of The Rooms Provincial Archives Division (F 37-19), St. John's, NL. Courtesy of The Rooms Provincial Archives Division (F 37-20), St. John's, NL. Courtesy of The Rooms Provincial Archives Division (F 37-22), St. John's, NL. Courtesy of The Rooms Provincial Archives Division (F 37-23), St. John's, NL. Courtesy of The Rooms Provincial Archives Division (F 37-24), St. John's, NL. Courtesy of The Rooms Provincial Archives Division (F 37-29), St. John's, NL. Courtesy of The Rooms Provincial Archives Division (F 37-9), St. John's, NL. Courtesy of The Rooms Provincial Archives Division (F 40-16), St. John's, NL. Courtesy of The Rooms Provincial Archives Division (F 40-18), St. John's, NL. Courtesy of The Rooms Provincial Archives Division (F 40-19), St. John's, NL. Courtesy of The Rooms Provincial Archives Division (F 40-23), St. John's, NL. Courtesy of The Rooms Provincial Archives Division (F 40-5), St. John's, NL. Courtesy of The Rooms Provincial Archives Division (F 46-12), St. John's, NL. Courtesy of The Rooms Provincial Archives Division (F 46-16), St. John's, NL. Taken at Holloway Studio (St. John's, NL). 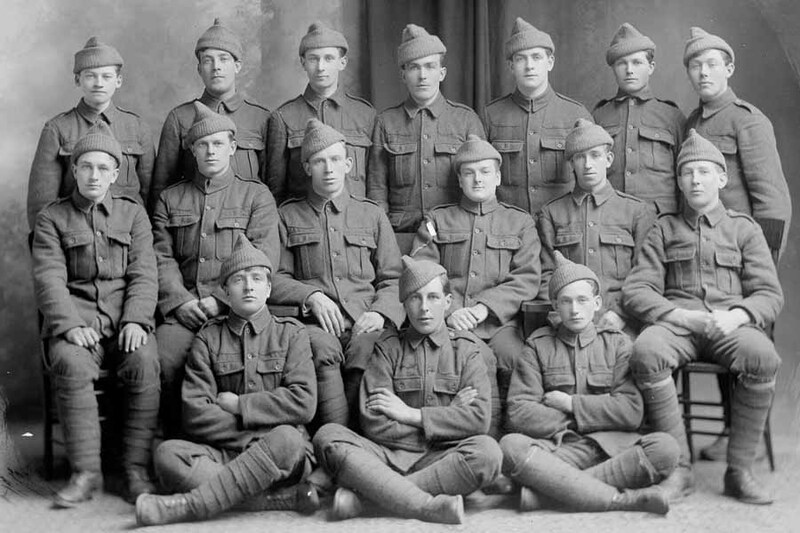 Two in front row wearing Regimental shoulder flashes and caribou pins in hats. 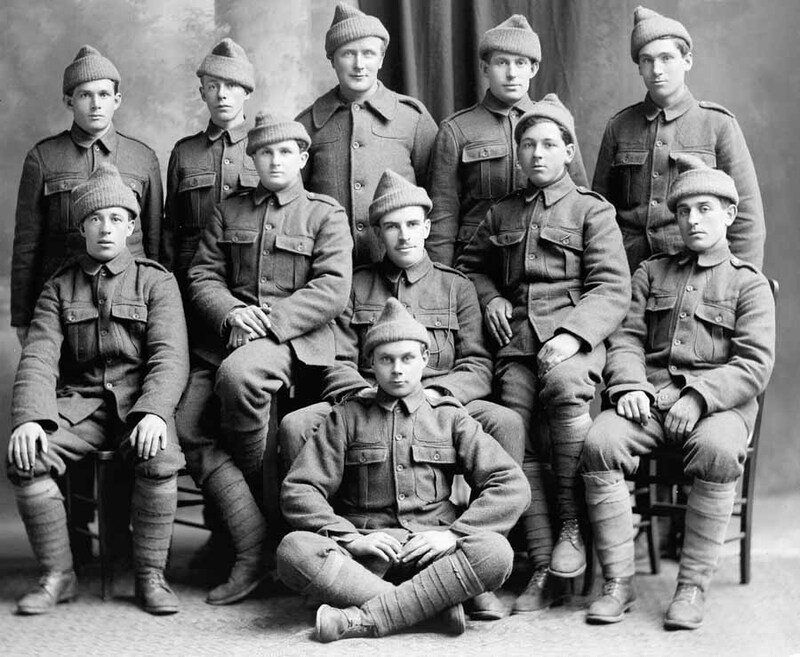 One soldier in front row is holding a civilian hat. Courtesy of The Rooms Provincial Archives Division (F 46-19), St. John's, NL. Courtesy of The Rooms Provincial Archives Division (F 46-21), St. John's, NL. 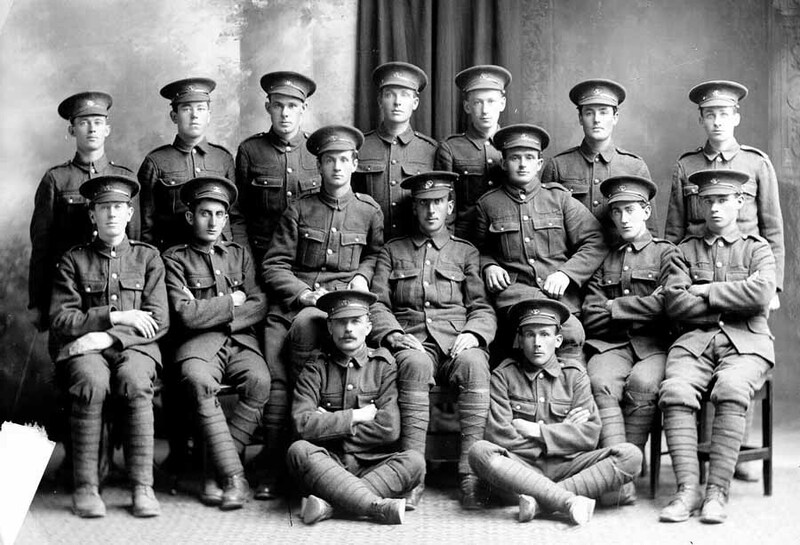 Identified: Private Stanley Budgell ( Regiment # 1856), third from left, back row. 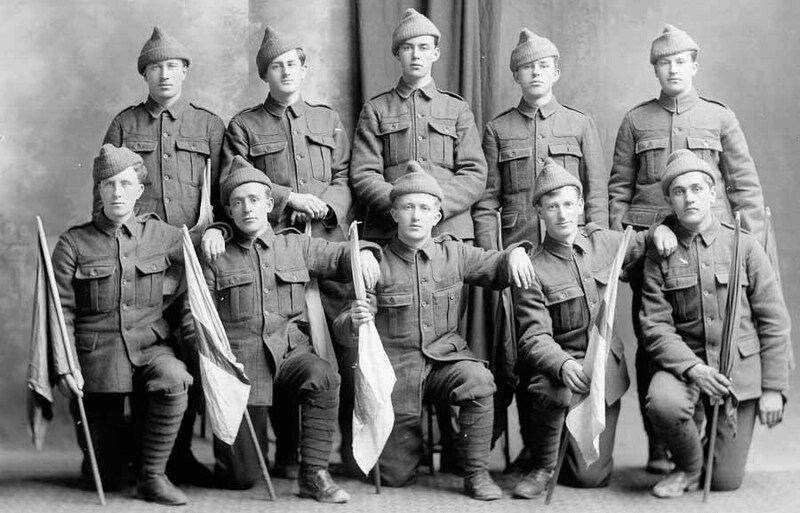 Image courtesy of The Rooms Provincial Archives Division (F 46-22), St. John's, NL. Information on Stanley Budgell courtesy of Heather Budgell. Taken by Holloway Studio (St. John's, NL). Courtesy of The Rooms Provincial Archives Division (F 46-24), St. John's, NL. 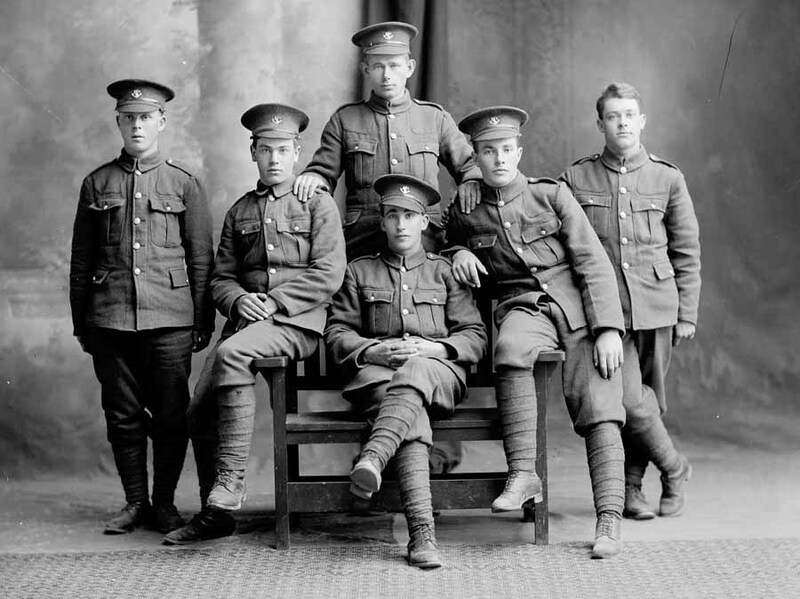 Taken by Robert Palfrey Holloway, Holloway Studio (St. John's, NL). 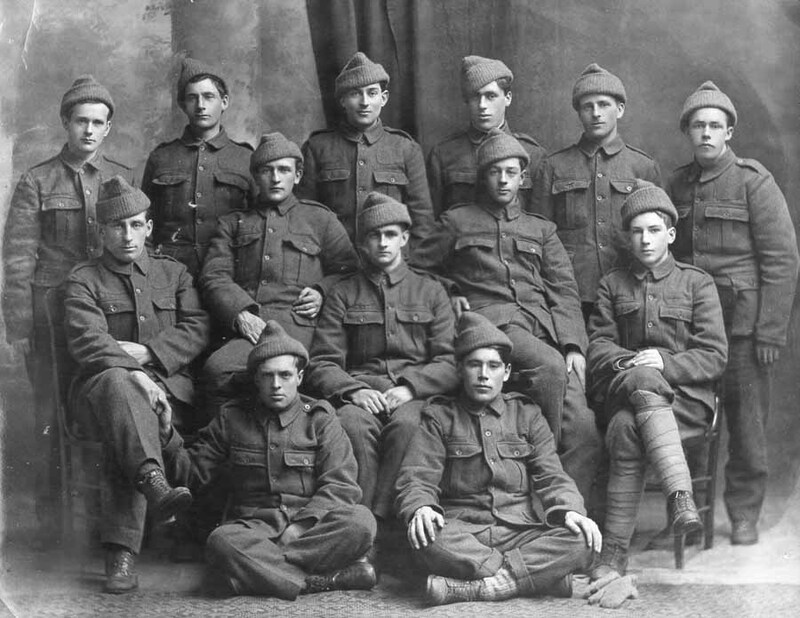 Studio group portrait, Section 12, Platoon 3. 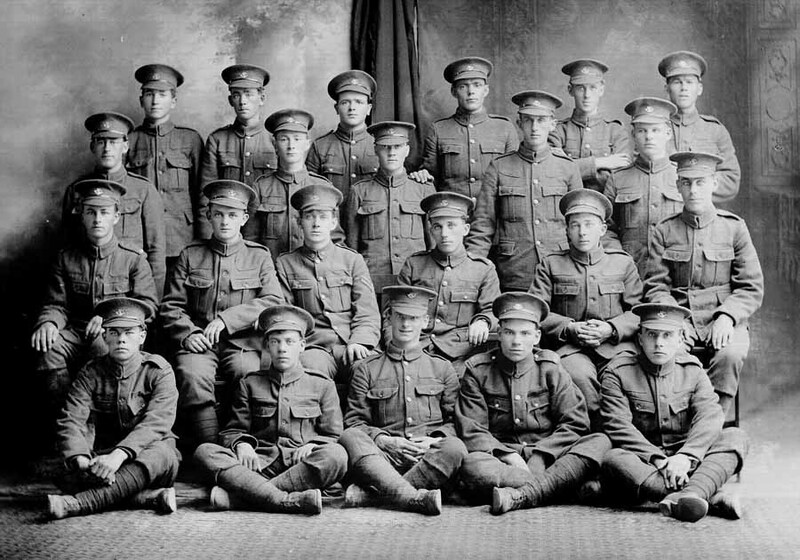 Identified: Kevin M. Keegan (Regiment # O-13), centre and Howard Leopold Morry ( Regiment # 726), third from left, back row. Courtesy of The Rooms Provincial Archives Division (F 48-1), St. John's, NL. Courtesy of The Rooms Provincial Archives Division (F 48-12), St. John's, NL. 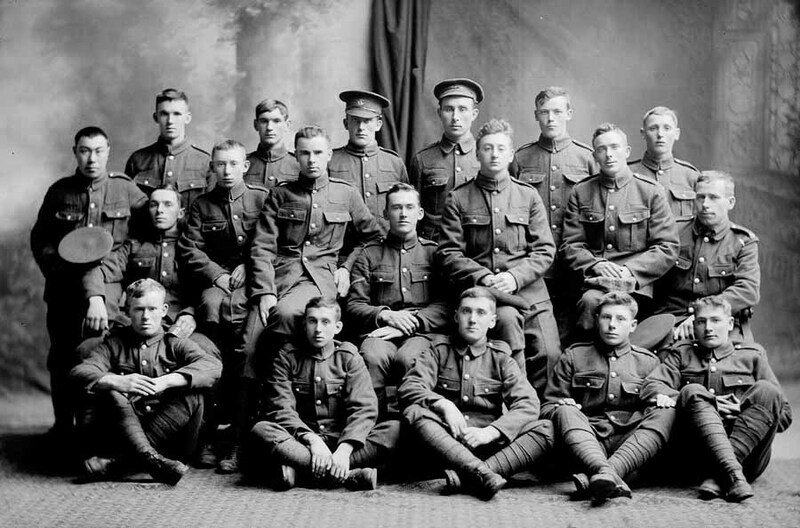 Courtesy of The Rooms Provincial Archives Division (F 48-13), St. John's, NL. Courtesy of The Rooms Provincial Archives Division (F 48-14), St. John's, NL. Courtesy of The Rooms Provincial Archives Division (F 48-16), St. John's, NL. Courtesy of The Rooms Provincial Archives Division (F 48-4), St. John's, NL. Courtesy of The Rooms Provincial Archives Division (F 48-5), St. John's, NL. Courtesy of The Rooms Provincial Archives Division (F 48-6), St. John's, NL. Courtesy of The Rooms Provincial Archives Division (F 48-8), St. John's, NL. Courtesy of The Rooms Provincial Archives Division (F 50-28), St. John's, NL. Courtesy of The Rooms Provincial Archives Division (F 50-29), St. John's, NL. Courtesy of The Rooms Provincial Archives Division (F 50-30), St. John's, NL. 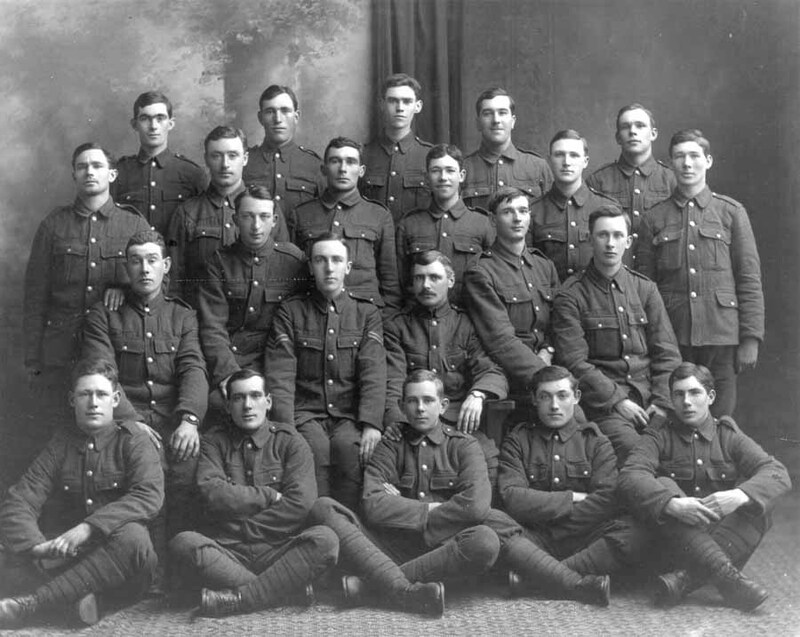 Courtesy of The Rooms Provincial Archives Division (F 21-12), St. John's, NL. Courtesy of The Rooms Provincial Archives Division (F 25-18), St. John's, NL. 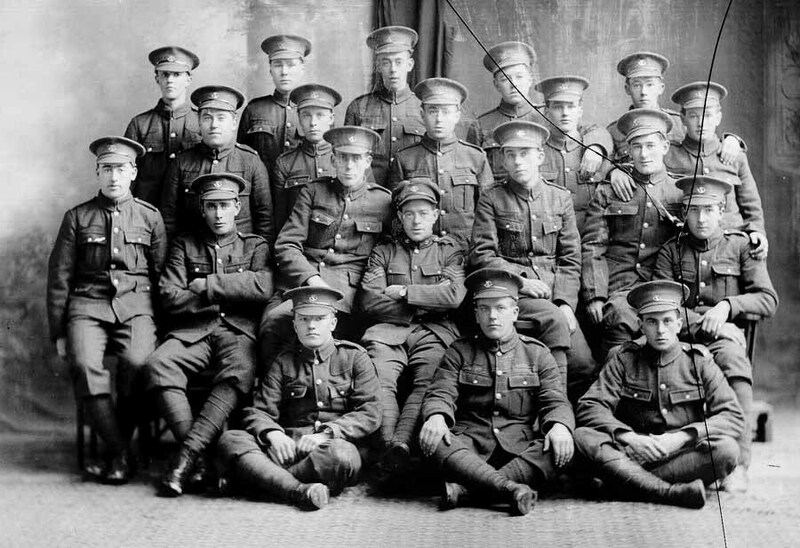 Officers seated in front with First Newfoundland Regiment soldiers, n.d. Courtesy of The Rooms Provincial Archives Division (F 37-30), St. John's, NL. 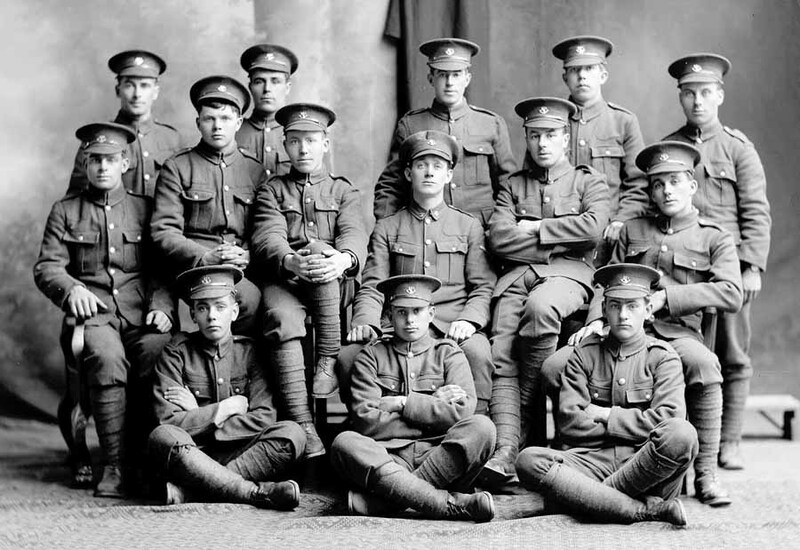 Officers of the Newfoundland Regiment, n.d.
Front, sitting on floor, 2nd. Lieut. Howard V. Reid (Regt. # 0-241); 2nd. Lieut. 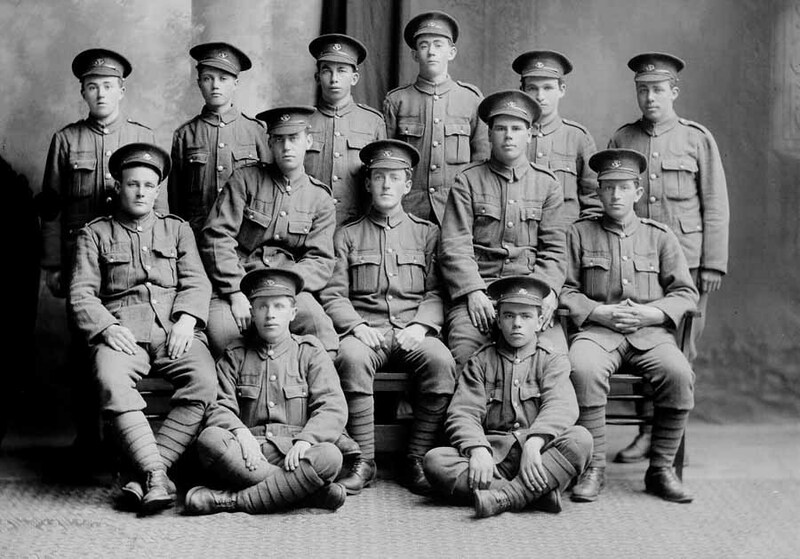 Cyril B. Carter (Regt. 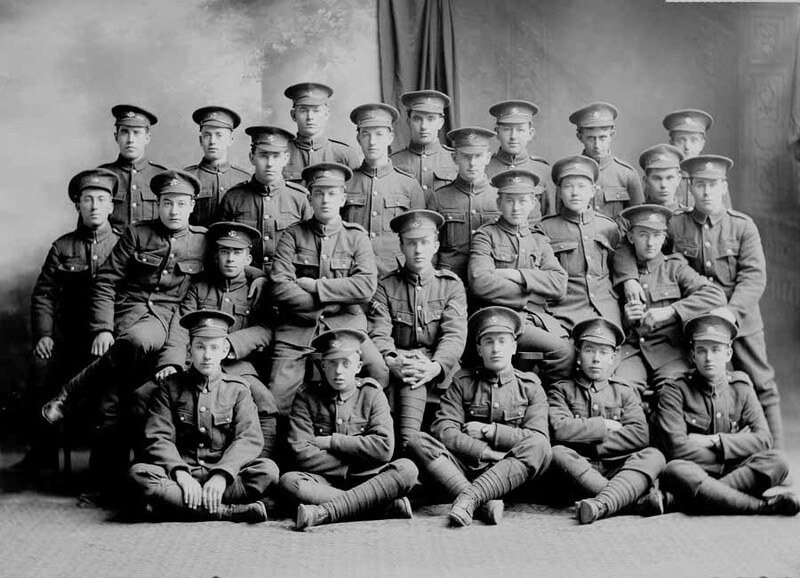 # 0-95); Second row, left, Lieut. James Donnelly (Regt. # 0-92); Capt. Eric Stanley Ayre ( Regt. # 0-91); Capt. Alexander Montgomerie (Regt. # 0-4); Capt. 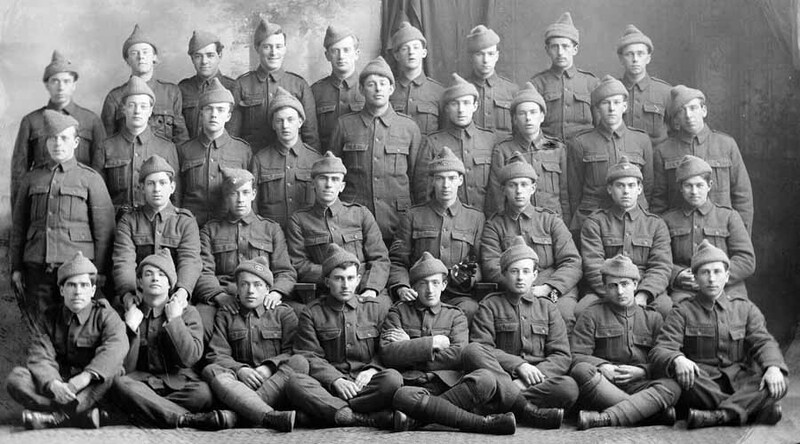 Lamont Paterson (Regt. # 0-7); Lieut. Henry Windeler (Regt. 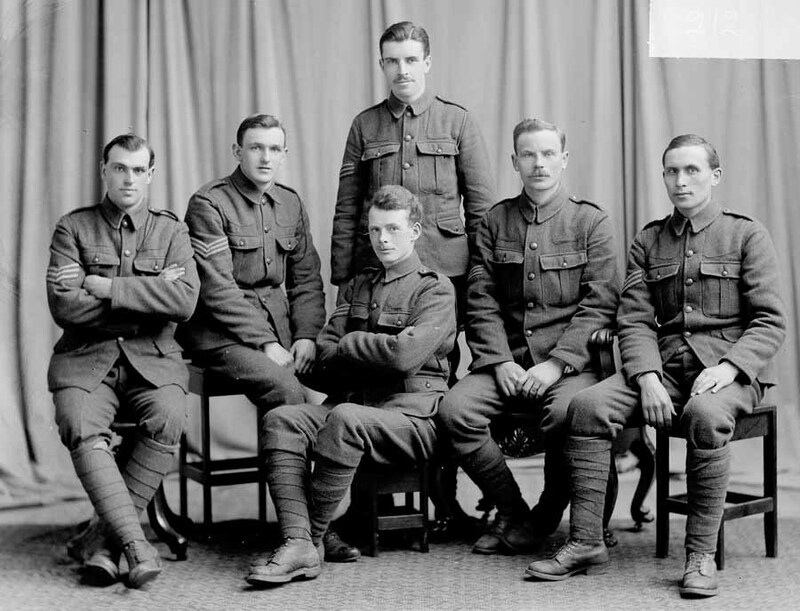 # 0-3) Top row, left, Herbert Rendell (Regt. 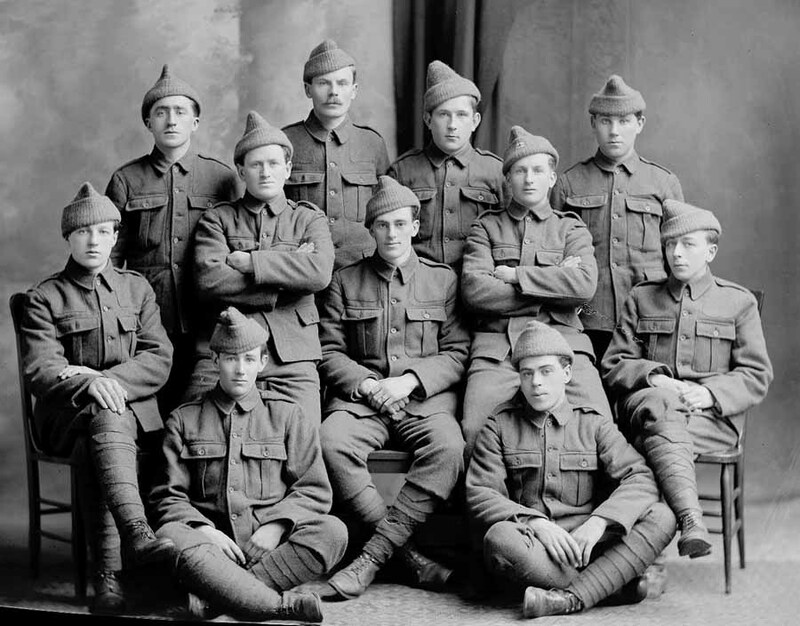 # 0-93); Stanley Robertson (Regt. 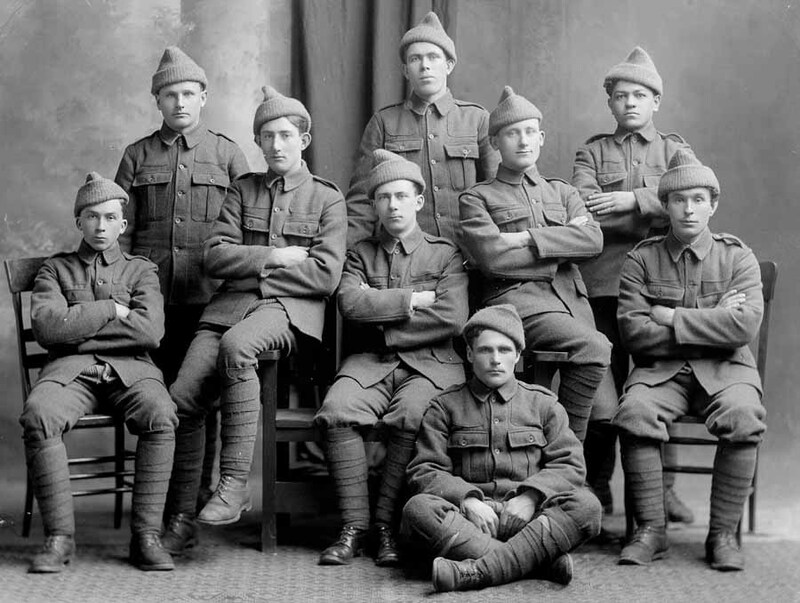 # 0-94); Wilfred J. Pippy (Regt. # 0-48). Note the collar dogs of Eric Ayre and Alexander Montgomerie. 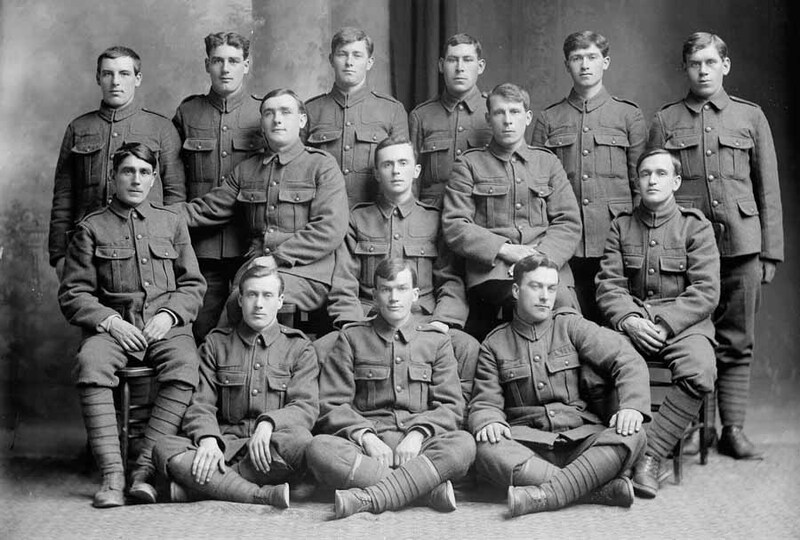 Courtesy of The Rooms Provincial Archives Division (F 25-17), St. John's, NL. Courtesy of The Rooms Provincial Archives Division (F 46-26), St. John's, NL. Courtesy of The Rooms Provincial Archives Division (F 46-27), St. John's, NL. Courtesy of The Rooms Provincial Archives Division (F 46-28), St. John's, NL. Courtesy of The Rooms Provincial Archives Division (F 46-29), St. John's, NL. Courtesy of The Rooms Provincial Archives Division (F 46-30), St. John's, NL. 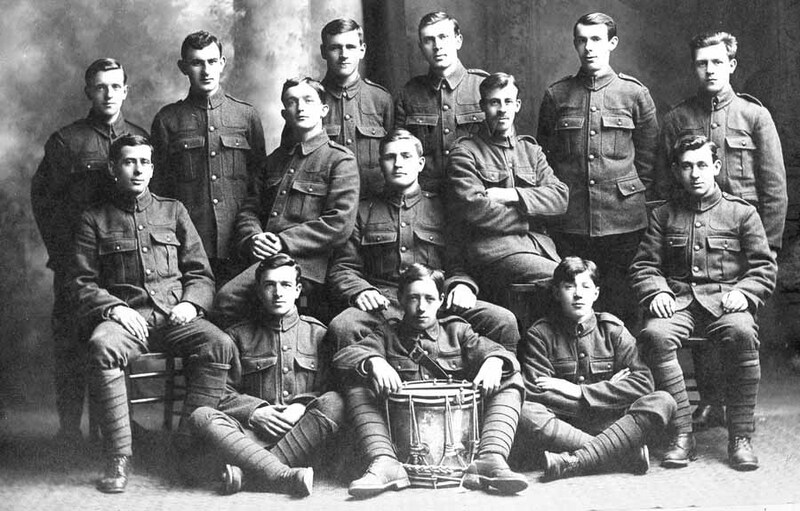 Back row: six soldiers standing with rifles and duffle bags over their shoulders, one soldier with drum. 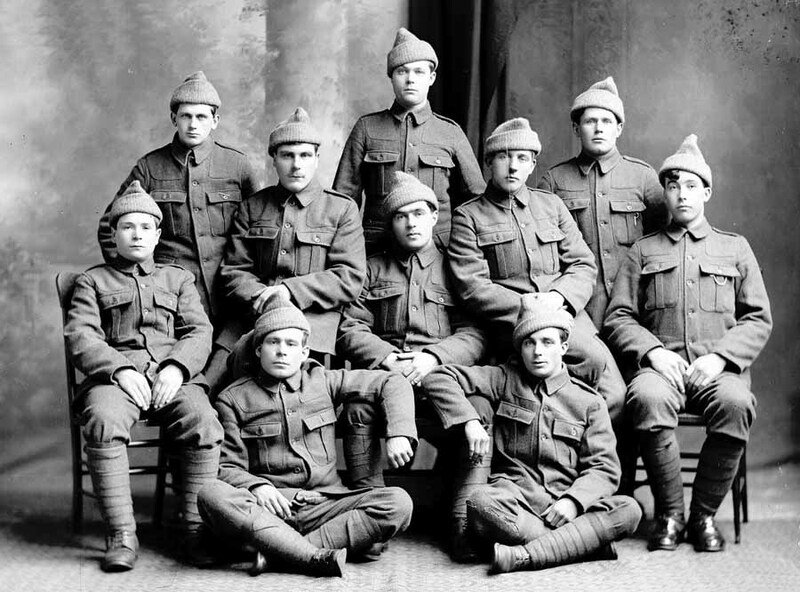 Front row: Six soldiers sitting with rifles and duffle bags over their shoulders. Courtesy of The Rooms Provincial Archives Division (F 25-2), St. John's, NL. Courtesy of The Rooms Provincial Archives Division (F 46-11), St. John's, NL. Courtesy of The Rooms Provincial Archives Division (F 46-15), St. John's, NL. Courtesy of The Rooms Provincial Archives Division (F 46-7), St. John's, NL. Courtesy of The Rooms Provincial Archives Division (F 46-8), St. John's, NL. Courtesy of The Rooms Provincial Archives Division (F 37-27), St. John's, NL. No. 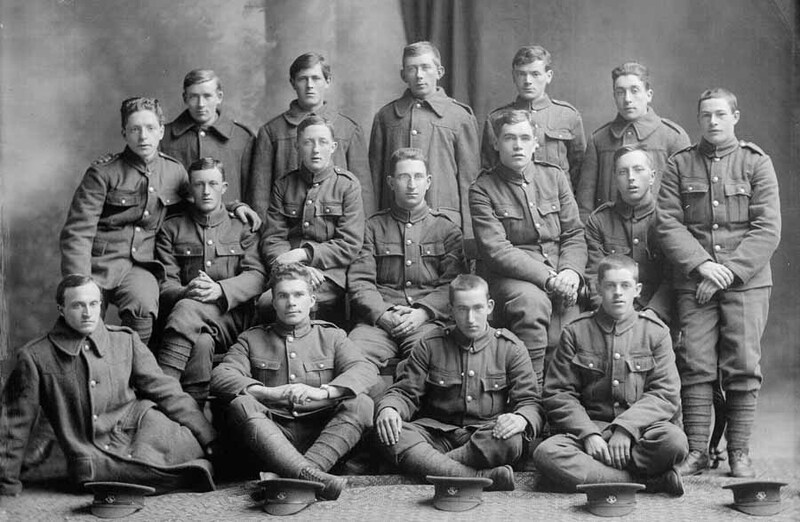 3 Platoon, A Company, Fort George, Scotland, 1915. 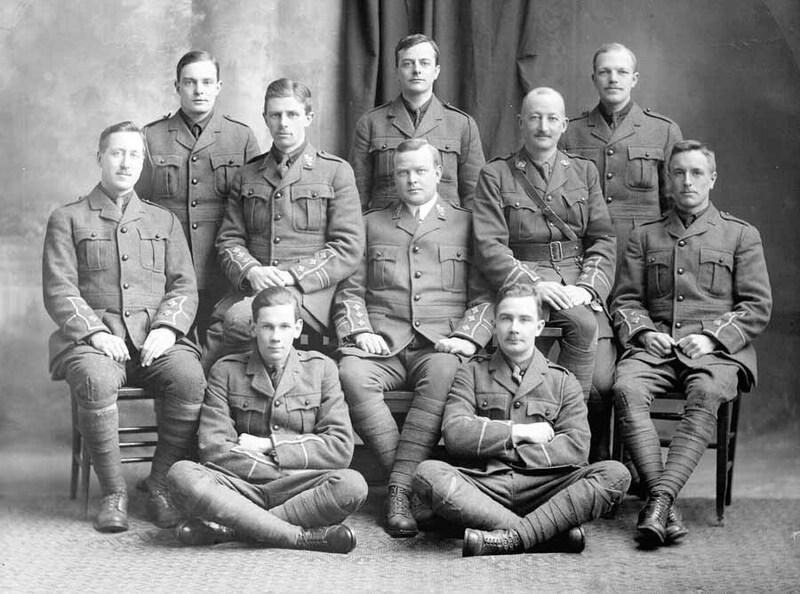 Front Row - Seated - Left to Right: Chesley Morton Peet; L/C Bertram William Oake; Capt. John Edward Joseph Fox; Lieut. Cecil Stanley James; Lieut. William Joseph Clare, M.I.D. ; Lieut. Robert Holland Tait, M.C. ; C.S.M. Arthur R. Canham, M.S.M. ; Hon. 2nd Lieut. Charles Edward White, M.S.M. ; Cpl. Robert Clare; Capt. Henry Morton Maddick; Drummer Eric Mckenzie Robertson. 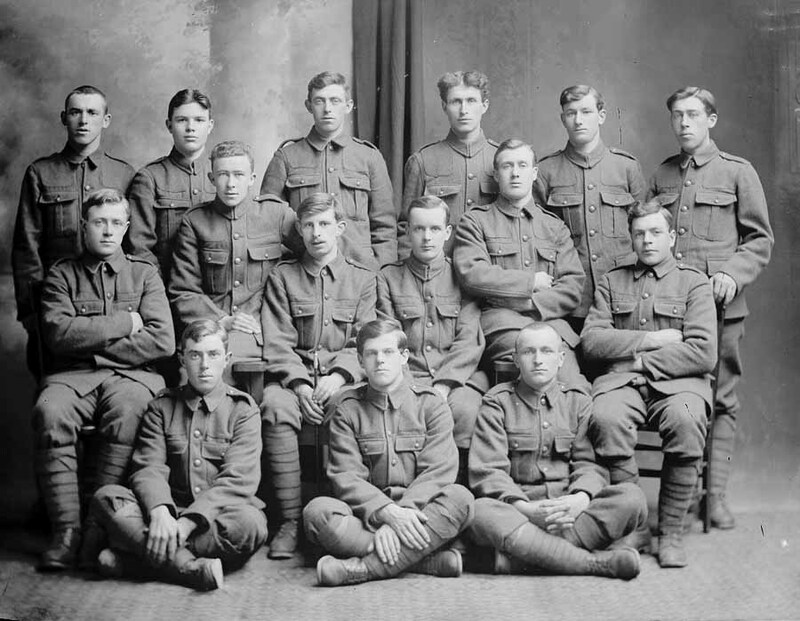 Courtesy of The Rooms Provincial Archives Division (B 3-18), St. John's, NL. Taken by D. A. Grant, Nairn, Scotland. 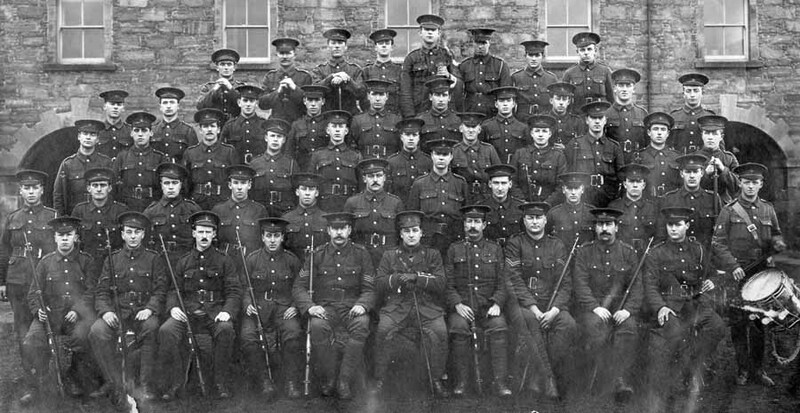 Formal portrait of officers and enlisted men outside of a stone building at Fort George. 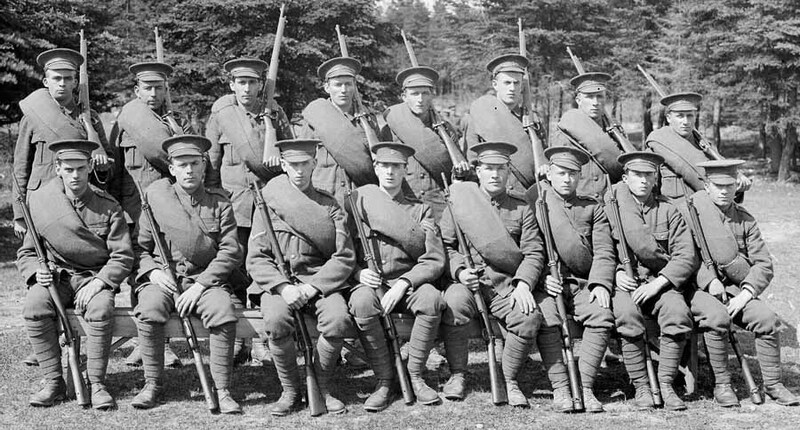 Note the Ross rifles. Photographs by D.A. 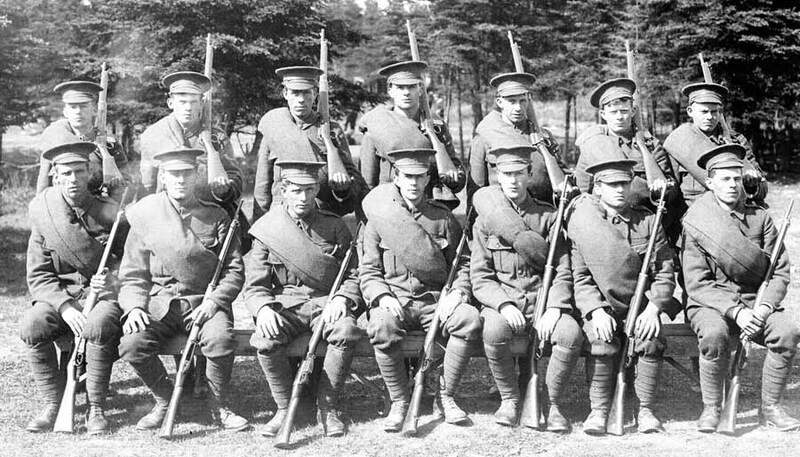 Grant were published in the Newfoundland Quarterly (Oct. 1915) and readers were invited to place orders for various sets of photographs. Price lists and descriptions were provided. Courtesy of The Rooms Provincial Archives Division (C 1-86a), St. John's, NL. Courtesy of The Rooms Provincial Archives Division (C 1-86b), St. John's, NL. 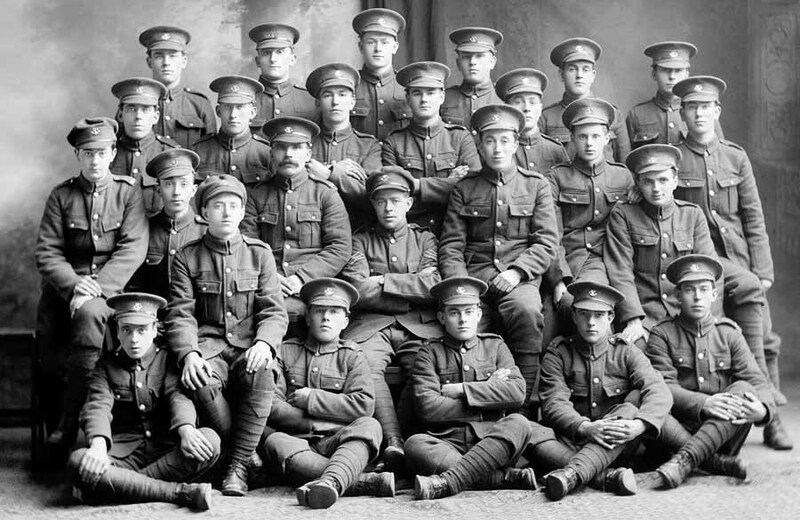 Officers and men of the Newfoundland Regiment. Taken by Henry Richard Gwyer Gibbs. Formal group portrait, exterior shot. 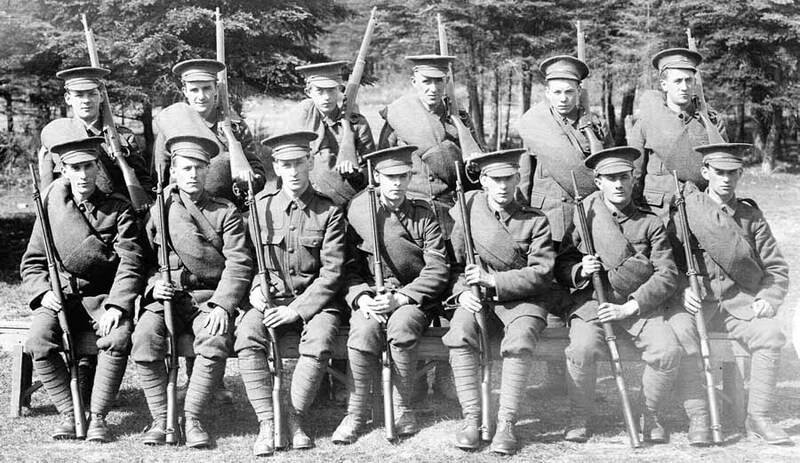 The photograph was taken in Pirbright, Surrey, England. Pirbright contains an army training barracks. Written on reverse: W. A. Munn. 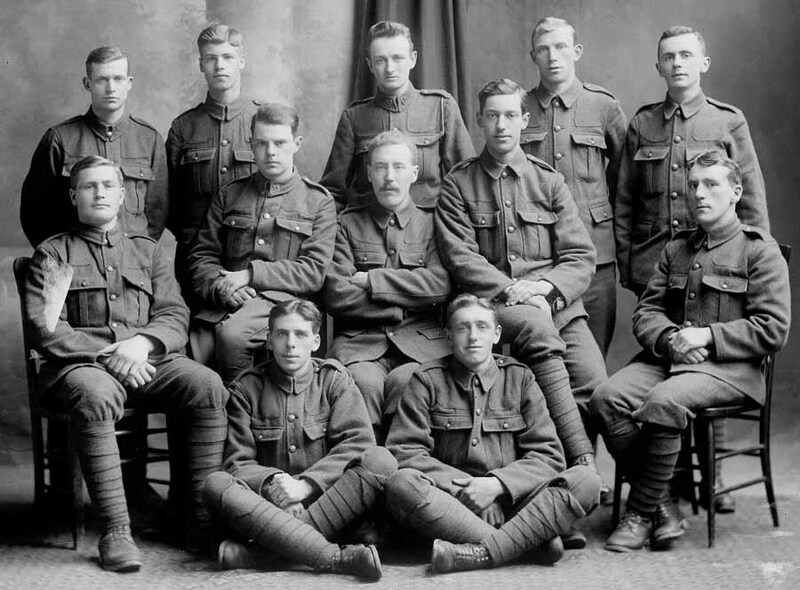 In the bottom right corner is written: "H. R. Gwyer Gibbs, Pirbright, 22804C." Courtesy of The Rooms Provincial Archives Division (C 1-92), St. John's, NL. Courtesy of The Rooms Provincial Archives Division (F 40-17), St. John's, NL. 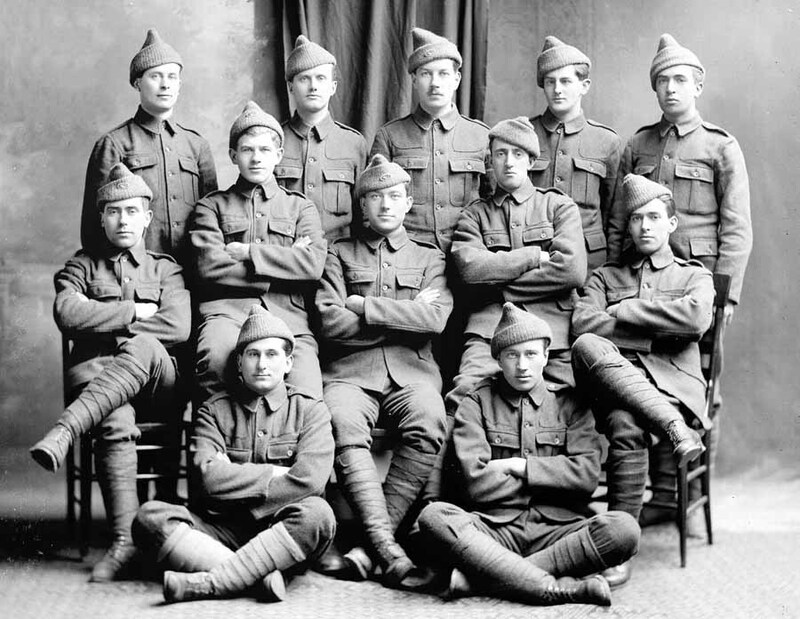 Officers of the First Newfoundland Regiment, n.d.
Top row—Capt. Tait, Capt. Ledingham, Capt. Nunns, Capt. Wighton [killed in action], Capt. Summers, Capt. Rowsell, Lieut. Goodridge, Lieut. Butler, Lieut. Dr. Wakefield. Seated—Capt. Ayre [returned on sick leave], Capt. Raley, Capt. O'Brien, Capt. 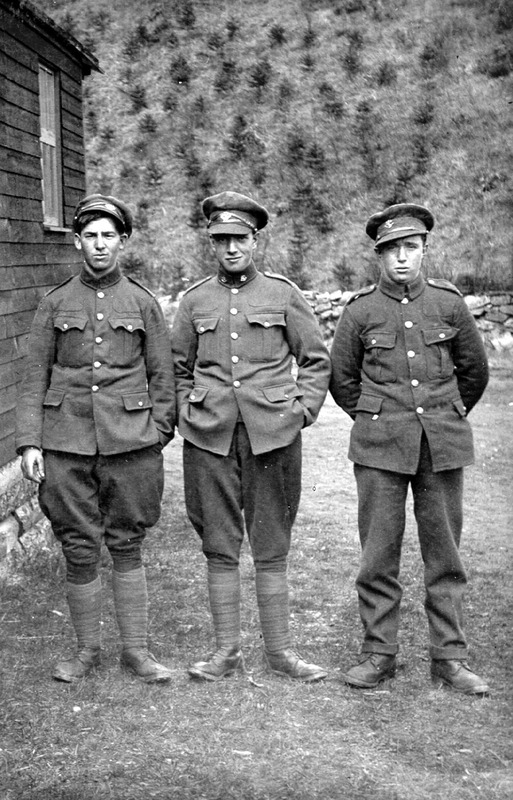 Alexander, Major Rendell, Lieut-Colonel Burton, Capt Carty [returned on furlough], Capt. Bernard [awarded Military Cross], Capt. March [on furlough]. 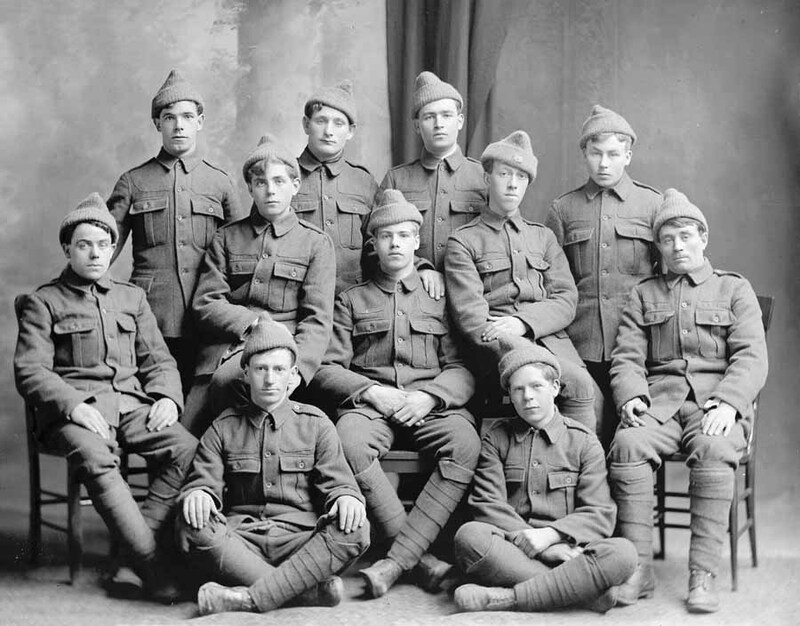 Image courtesy of The Rooms Provincial Archives Division, St. John's, NL. Names of the officers from The Newfoundland Quartely, Vol 16, No. 1 (July 1916), p. 12. Taken outside the Officer's Mess. 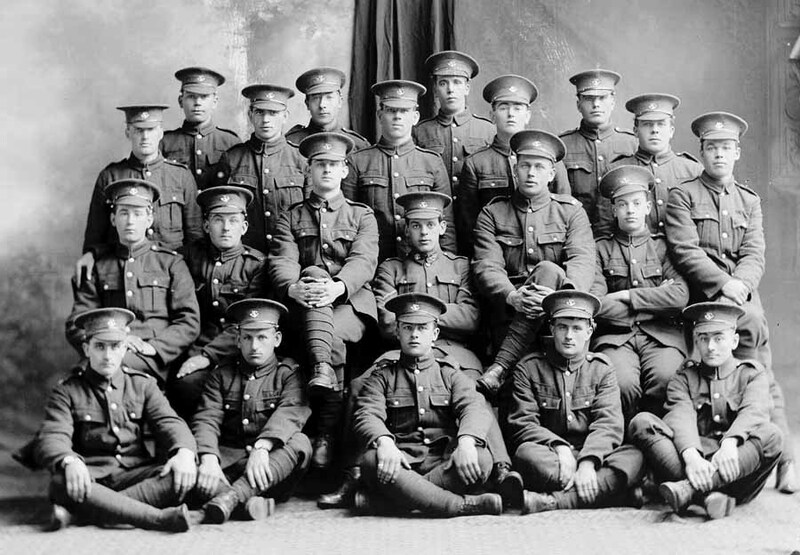 Identified: Front row, left to right: Lieut. Richard Aloysius Shortall, (Regt. # O-78, 395); Knight [? ]; Capt. George T. Carty (Regt. # O-6); Lieut. Joseph Nunns (Regt. # O-10); Lieut. Robert Holland Tait (Regt. # O-11). 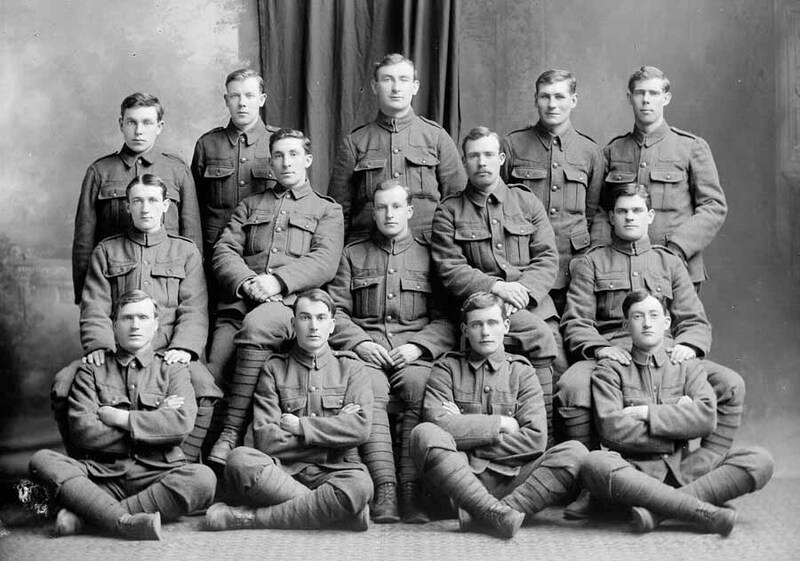 Back row, left to right: James Donnelly (Regt. # O-92); Michael Francis Summers (Regt. # O-158); Richard John Sheppard (Regt. # O-88, 282); Robin Stick (Regt. # O-18, 46). Courtesy of The Rooms Provincial Archives Division (A 58-82), St. John's, NL. 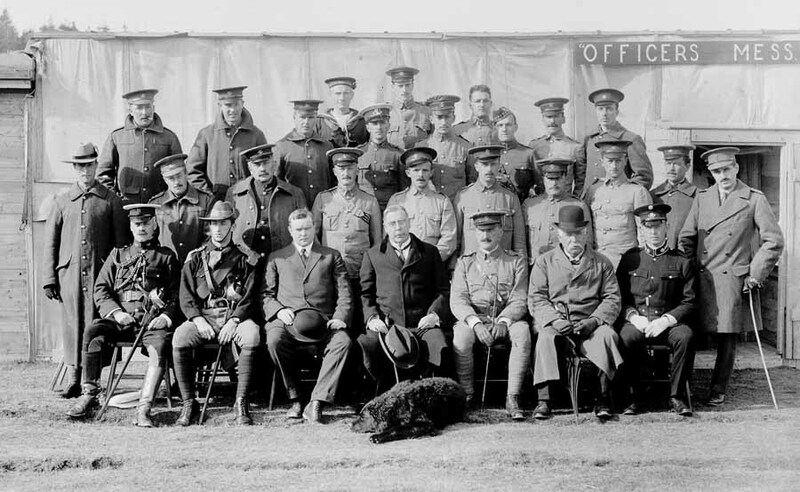 Officers of the First Newfoundland Regiment with British Officers, ca. 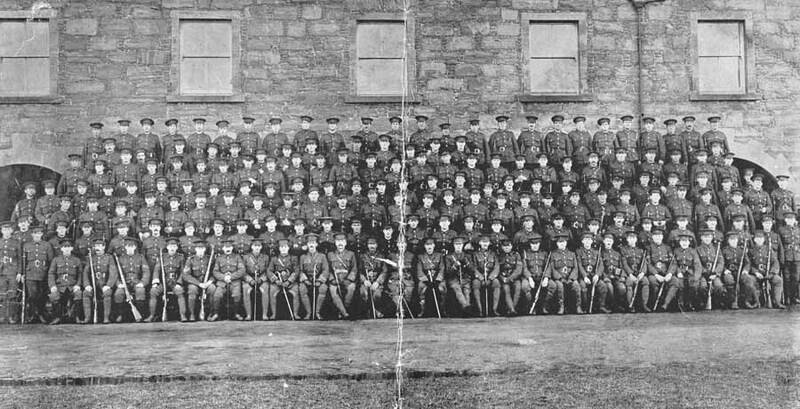 1916-1918. Taken at Fort William. 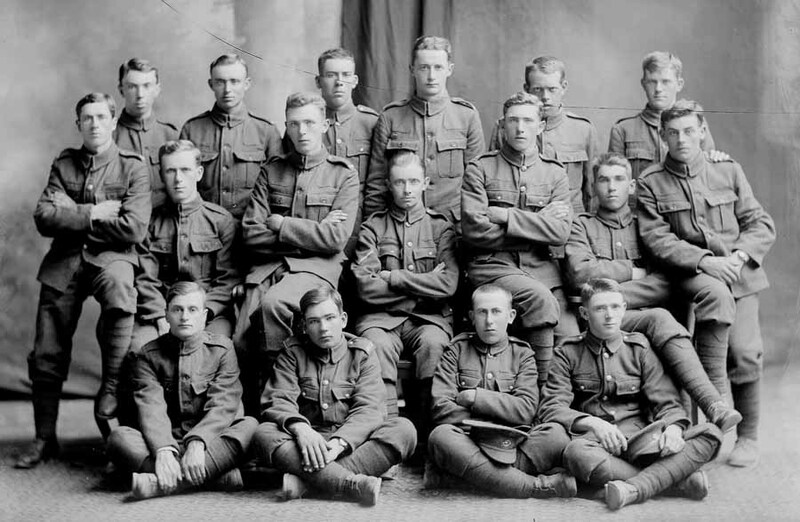 Identified: Front row, l-r: Capt. Robert Holland Tait (Regt. # 0-11); Maj. James Forbes-Robertson (Regt. # O-2); Maj. Alexander Montgomerie (Regt. # O-4); Maj. Lamont Paterson (Regt. # O-7); Capt J. J. O'Grady (Regt. # O-143). 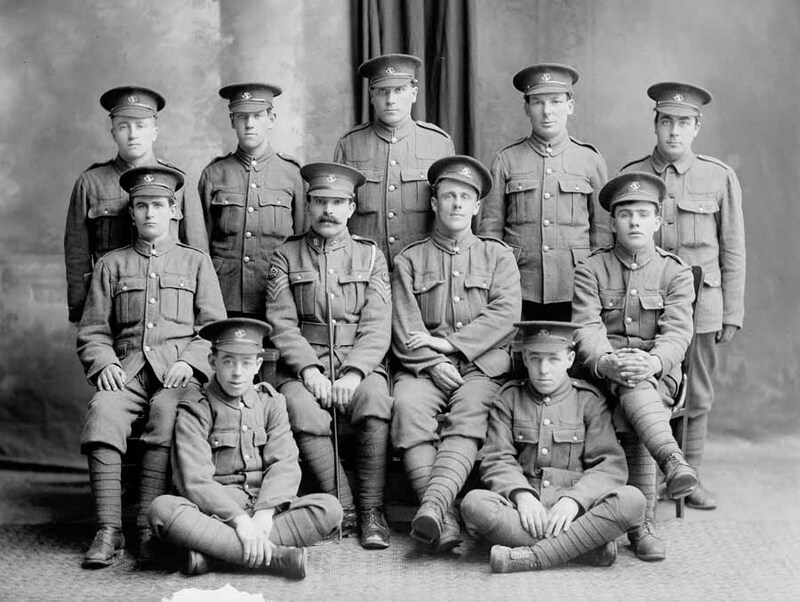 Middle row, l-r: Lieut. Augustus Leo Summers (Regt. # O-93); Lieut. W. Rees; Capt. 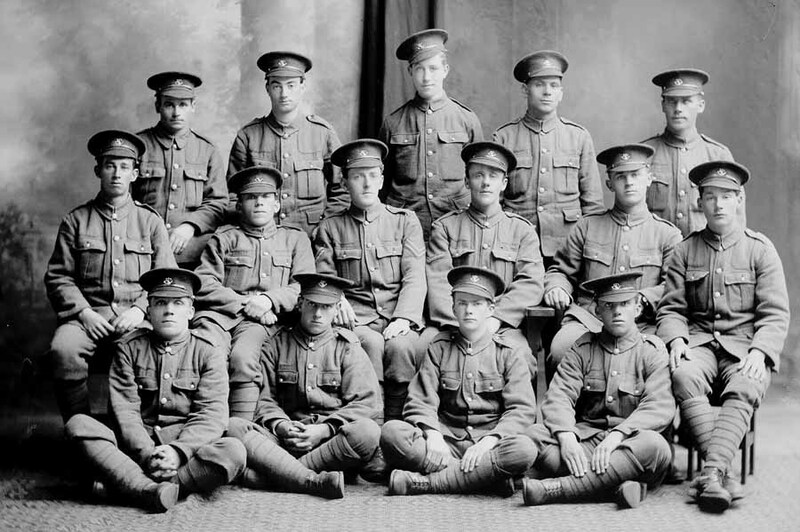 W. J. Pippy (Regt. # O-48); Lieut. R. Field [Leonard S. A.? ]; Capt. Joseph Henry Snow (Regt. # 74). Top row, l-r: Capt. Leo Charles Murphy (Regt. # O-35); Capt. John G. Bemister (Regt. # O-36, 1181); Lieut. Charles Watson (Regt. # 774); Capt. 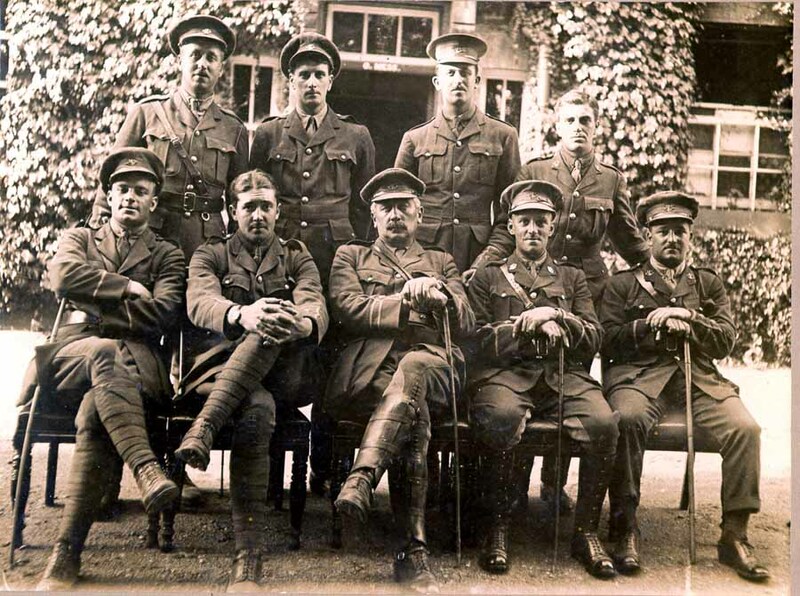 Cyril Chancey Duley (Regt. # 872). Courtesy of The Rooms Provincial Archives Division (F 46-14), St. John's, NL. Identification of Capt. J. J. O'Grady courtesy of his granddaughter, Karen Murray. Seated (left to right): Capt. A. C. Goodridge (A.D.C. to Governor), Capt. W. F. Rendell, Capt. A. Montgomerie, HE Governor Sir Walter Davidson, Capt. W. H. Franklin, Prime Minister Sir E. P. Morris, Capt. C. Macpherson, M.O. 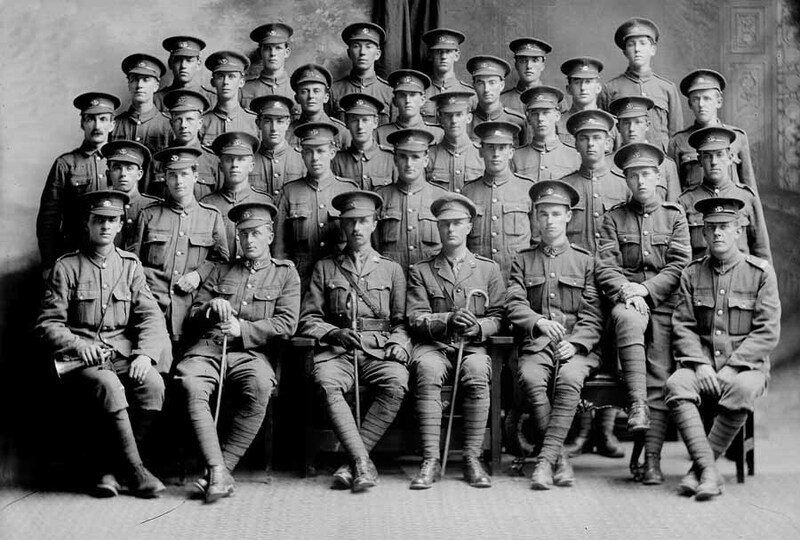 Second Row: Lieut. H. Goodridge, Capt. C. Alexander, Capt. G. Carty, Capt. L. Paterson, M.O., Capt. A. E. Bernard, Lieut. H. A. Outerbridge, Q.M., Capt. H. A. Timewell, P.M., Lieut. R. S. Rowsell, Capt. A. O'Brien, Capt. G. H. F. Abraham. 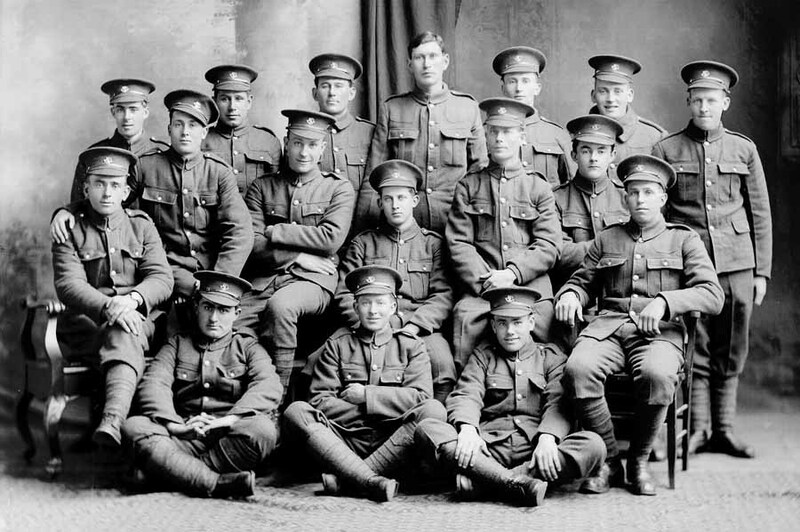 Back Row: Lieut. C. Wighton, Lieut. N. Alderdice, Lieut. C. Howlett, Capt. A. W. Wakefield, M.O., Lieut. J. A. Ledingham, Lieut. M. F. Summers, Q.M., Lieut. C. R. Ayre, Lieut. R. H. Tait, Lieut. J. Nunns, Capt. J. W. March, Lieut. A. Raley. Courtesy of The Rooms Provincial Archives Division (F 30-26), St. John's, NL. 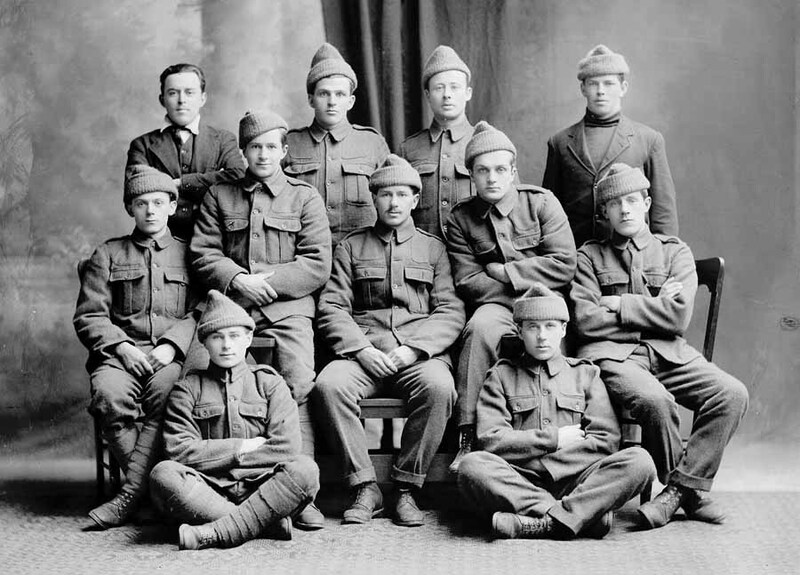 First Newfoundland Regiment Officers and Men, n.d. 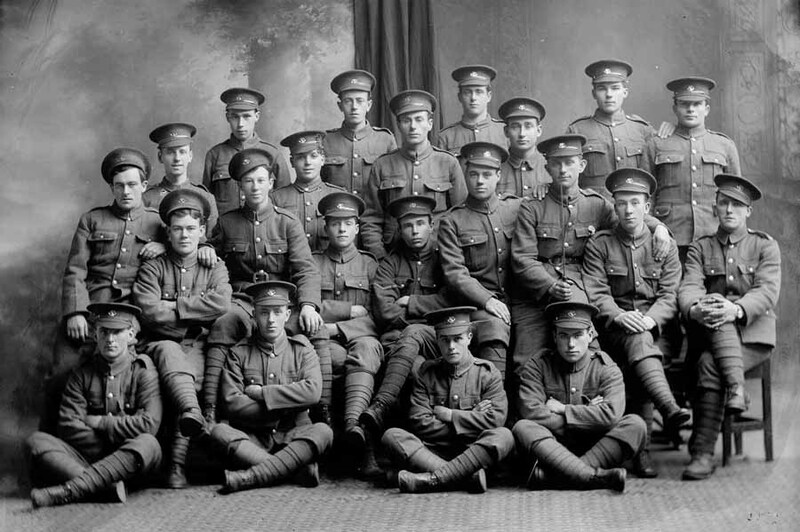 Courtesy of The Rooms Provincial Archives Division (VA 40-9.4), St. John's, NL. 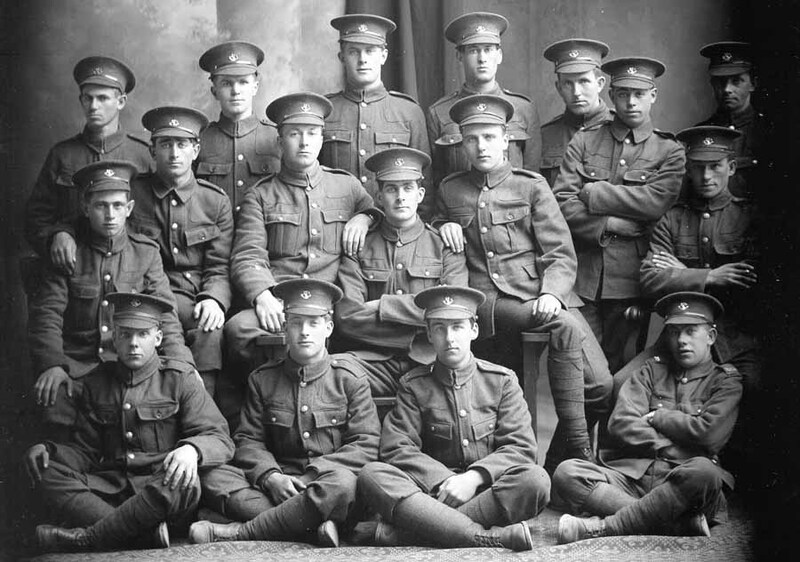 Courtesy of The Rooms Provincial Archives Division (VA 40-9.2), St. John's, NL. 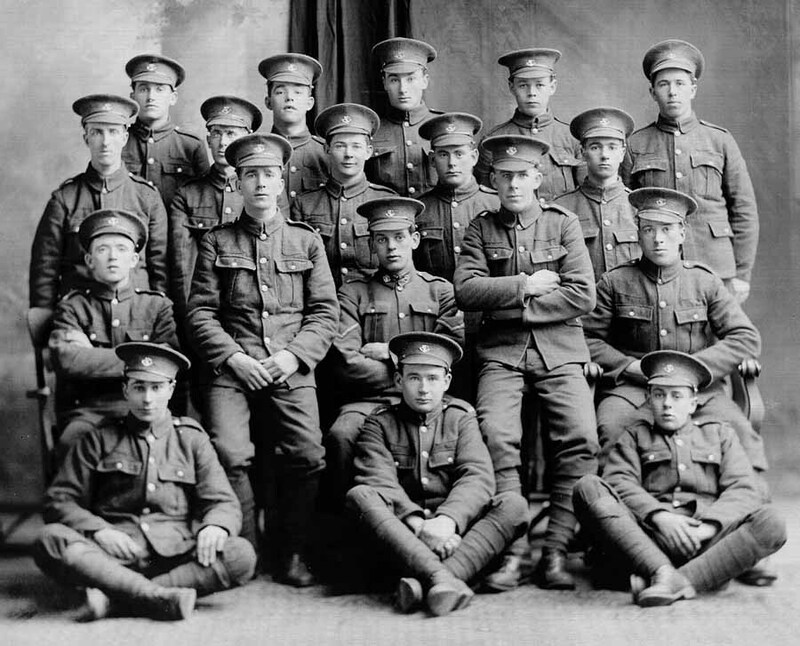 Courtesy of The Rooms Provincial Archives Division (VA 40-9.1), St. John's, NL. 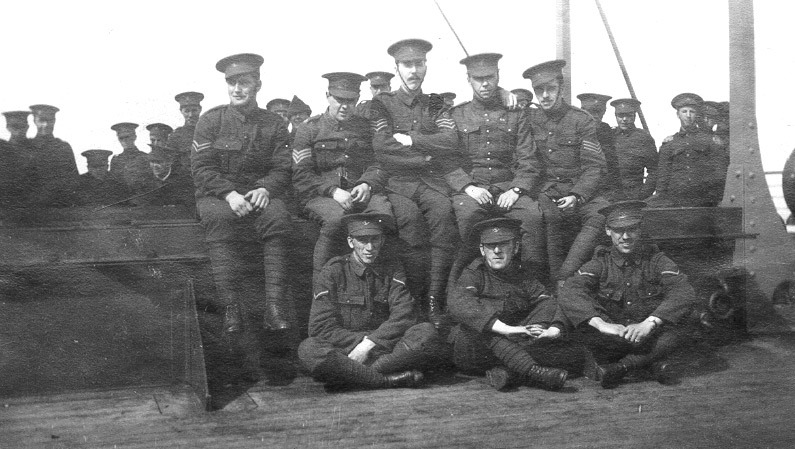 First Newfoundland Regiment soldiers, n.d.
Non-Commissioned Officers on board a ship. 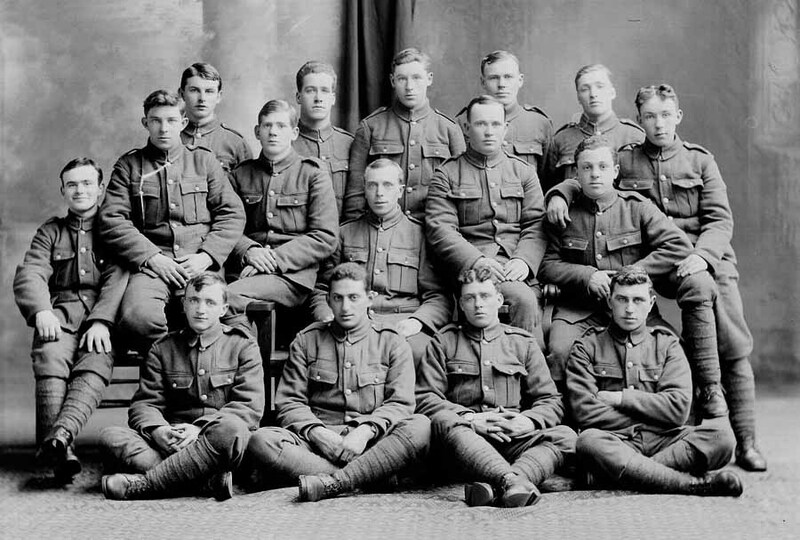 Courtesy of The Rooms Provincial Archives Division (VA 36-8.2), St. John's, NL. 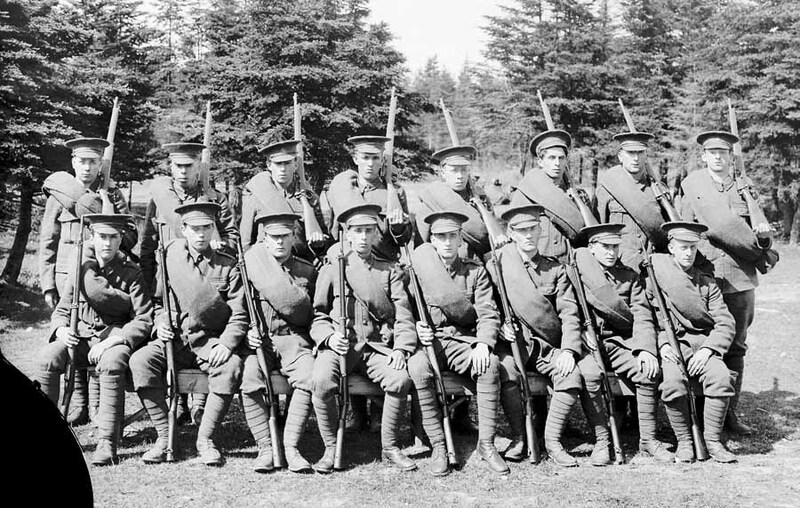 Newfoundland Regiment soldiers preparing for a meal. 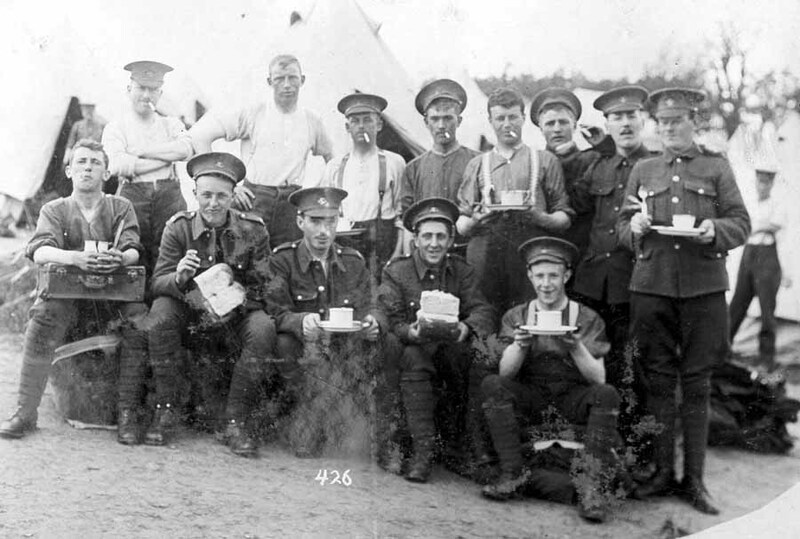 Soldiers are holding articles from their mess kit; one is holding a loaf of bread. 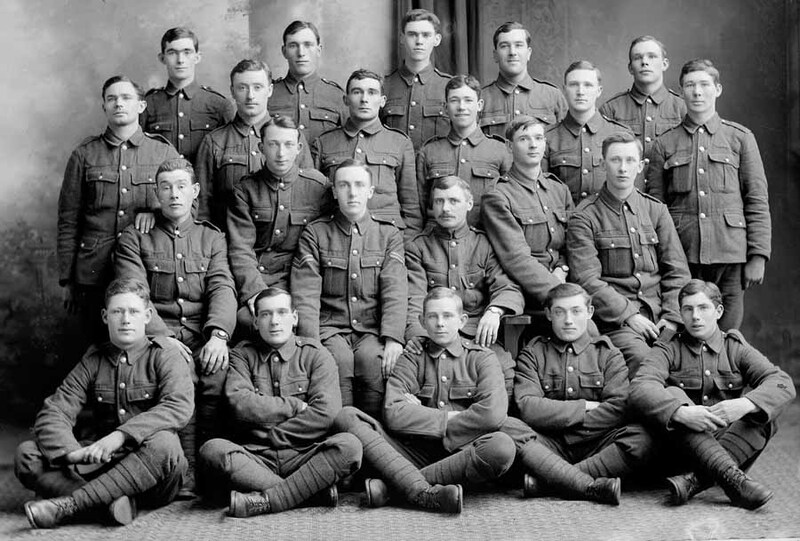 Courtesy of The Rooms Provincial Archives Division (VA 40-21.4), St. John's, NL. 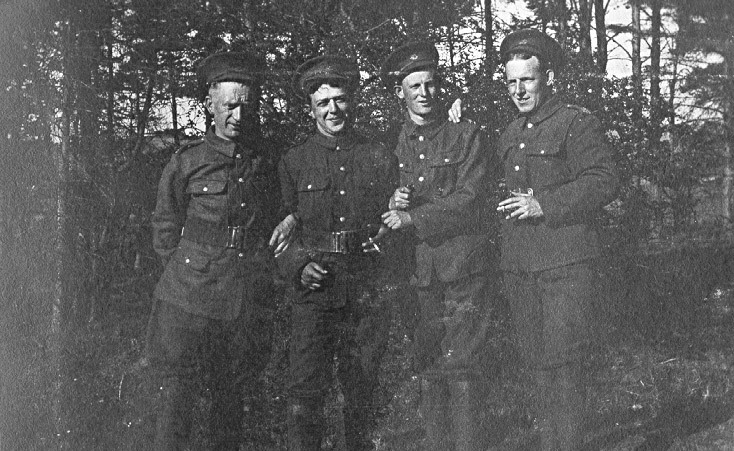 Men washing at Newfoundland Regiment camp. 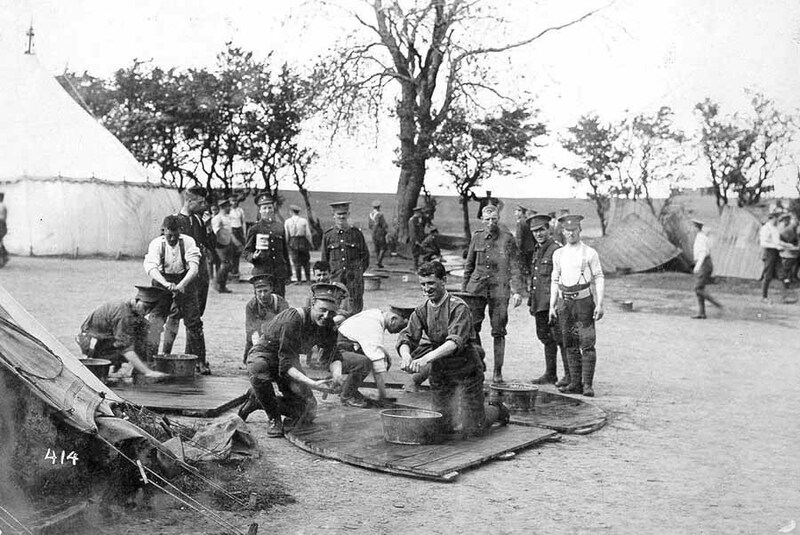 Soldiers are possibly washing wooden boards, which might be used for temporary shelters. There are other boards in the background. 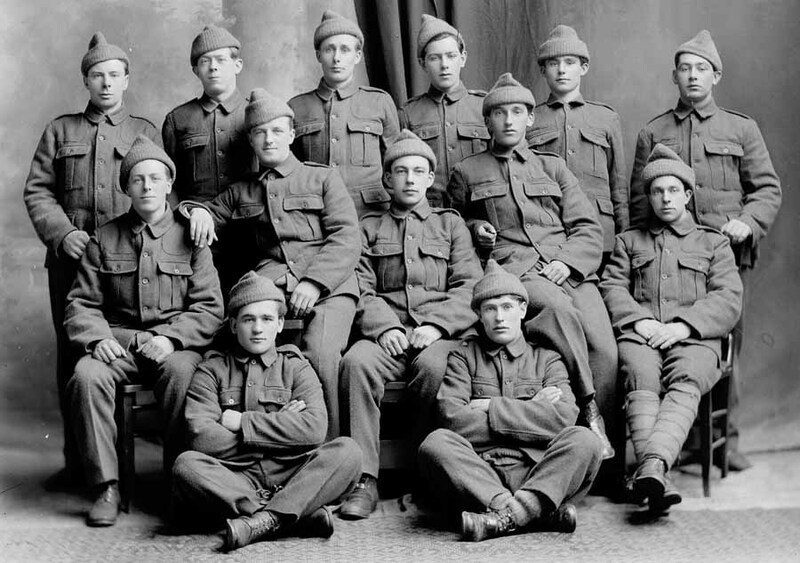 Courtesy of The Rooms Provincial Archives Division (VA 40-21.3), St. John's, NL. Taken by: J. Cook (Ayr, Scotland). [Aug. 1915]. 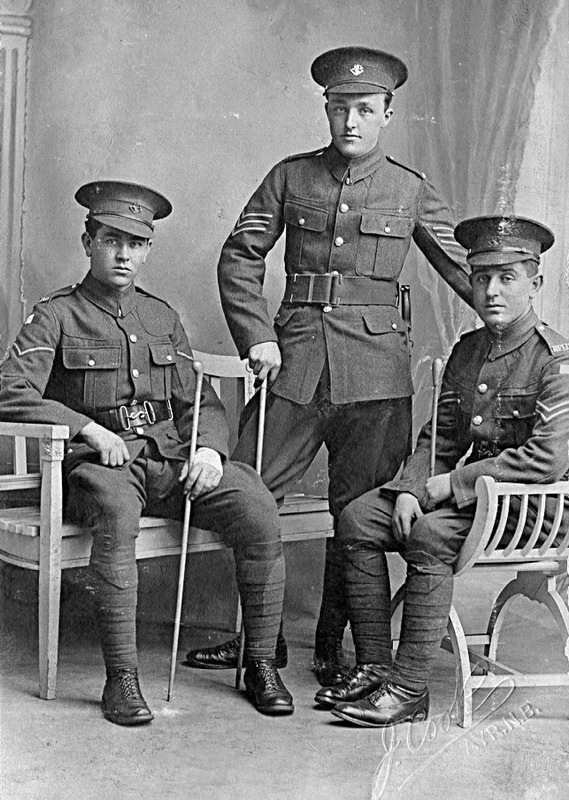 Three ranks represented: a Lance-Corporal, Corporal, and a Sergeant. 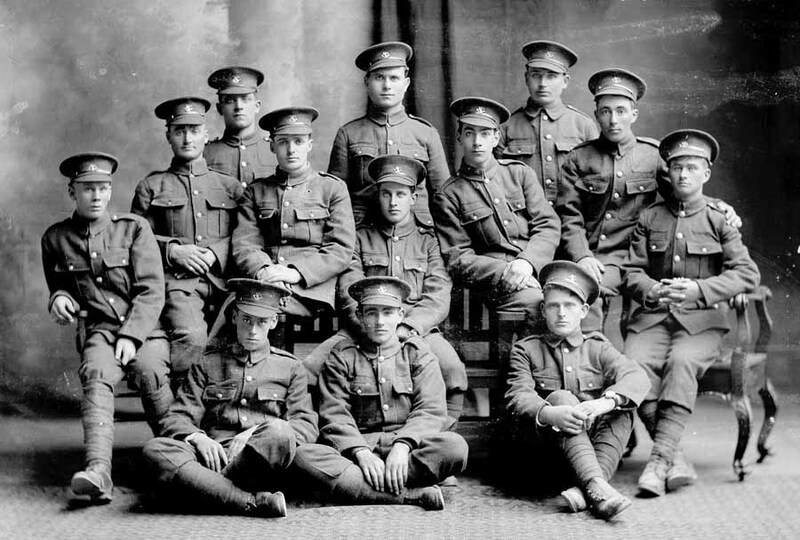 Courtesy of The Rooms Provincial Archives Division (VA 40-9.5), St. John's, NL. 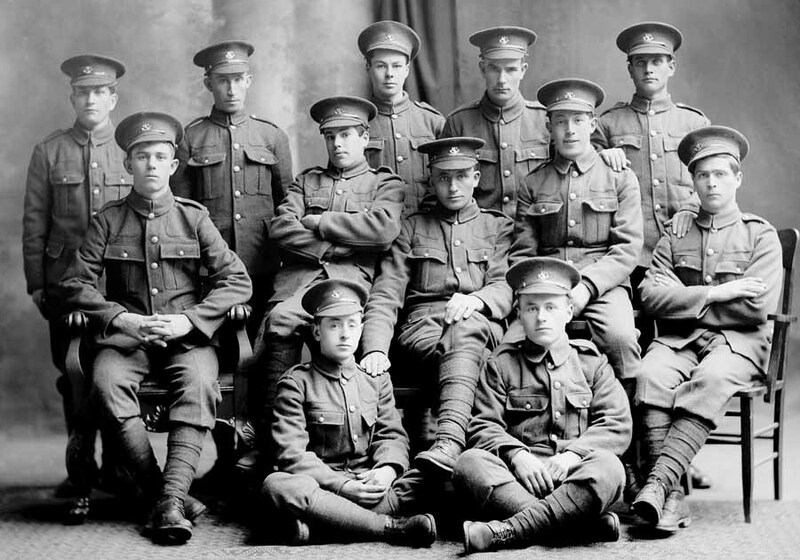 Courtesy of The Rooms Provincial Archives Division (VA 40-9.3), St. John's, NL. 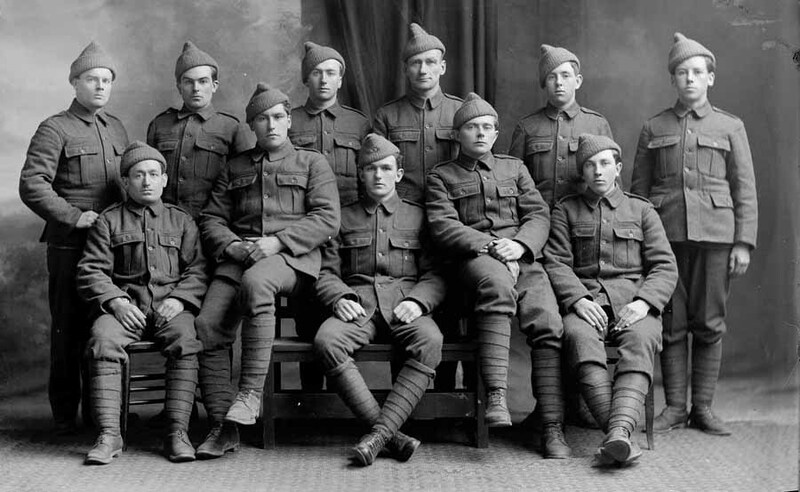 Courtesy of The Rooms Provincial Archives Division (VA 58-5), St. John's, NL. 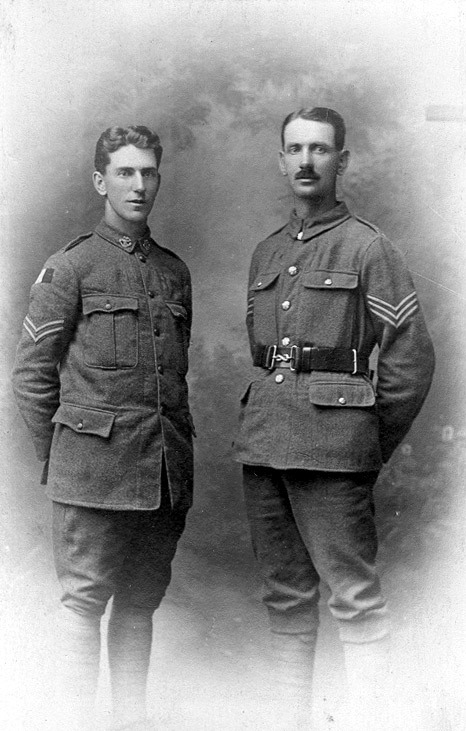 Two unidentified soldiers: a Corporal and Sergeant. 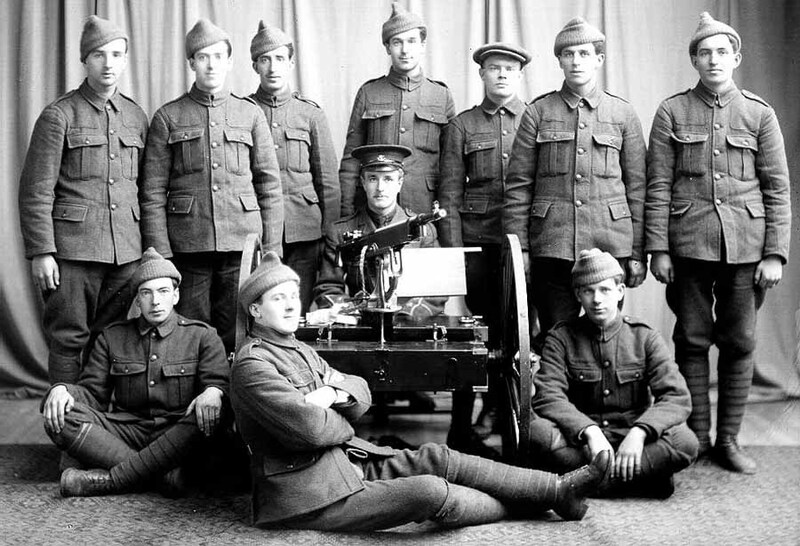 Courtesy of The Rooms Provincial Archives Division (VA 40-6.2), St. John's, NL.